The mehndi art is one of the most loved form of art among the Asians. Gone are the days when you had to be a pro at mehndi designs to adorn your hands and feet with beautiful and simple mehndi designs. 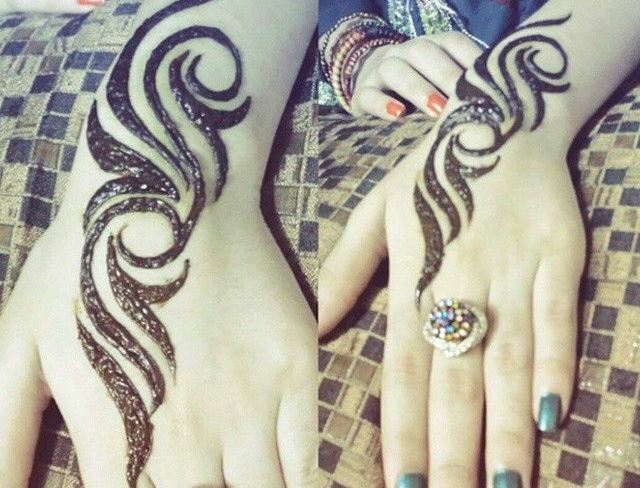 whoever said you had to take lessons or attend an institute to learn mehndi form of art, not anymore. 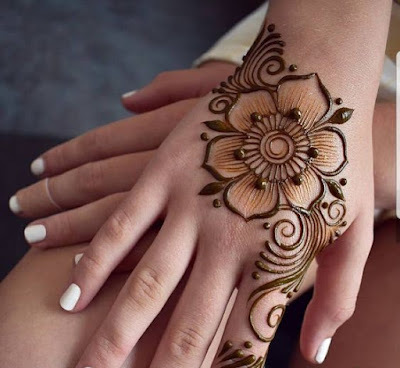 There are plenty of beautiful yet easy mehndi designs that one can master and draw on their own. All you have to do is practice and get familiar with the basics of this beautiful art. 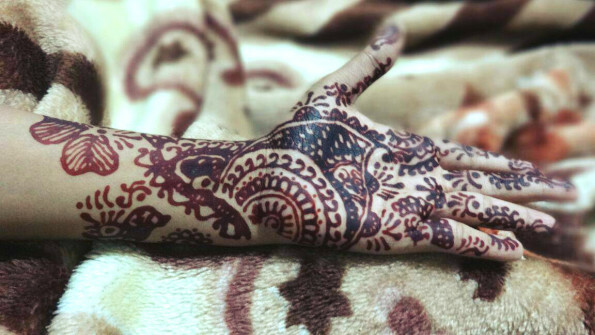 Women who want to learn the art of mehndi might have plenty of reasons. 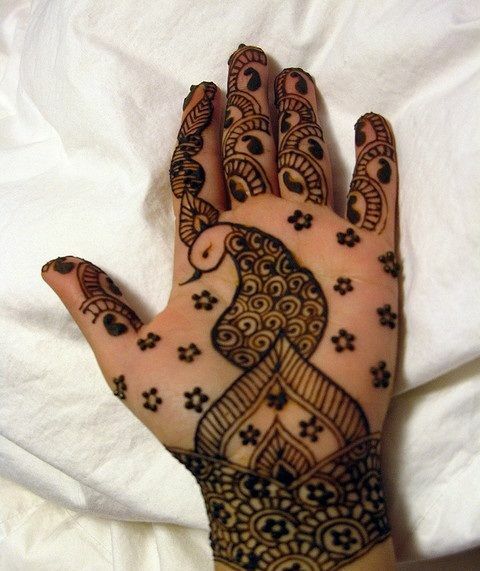 The most common reason is the high expenses charged by mehndi artists to adorn a single hand or two hands. For example my mother learnt the art to avoid paying mehndi artists who charged sky rates for her three daughters. Not all can afford a mehendi artist.Other reasons include people wanting to do their own mehndi on their weddings or mothers wanting to decorate their daughters hands and feet to give that personal touch to their little princess's wedding or one might want to learn so they can adorn their breasts or other body parts they are not comfortable exposing to the outer world.After all mehndi design and the beautiful stain it leaves is a great form of seduction and Aphrodite. 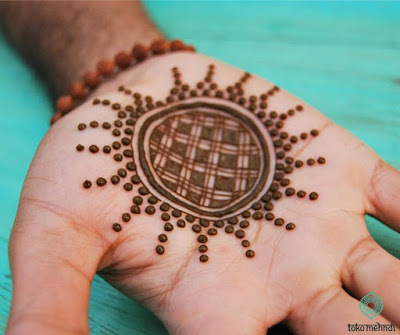 Here are a few mehndi tips and tricks that will help you in learning and applying mehndi easily. 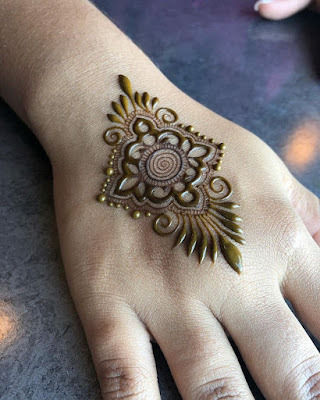 You don't have to draw a large circle in the middle of your palm and cap your fingers with henna paste anymore for drawing mehndi patterns is easier then you could have imagined! 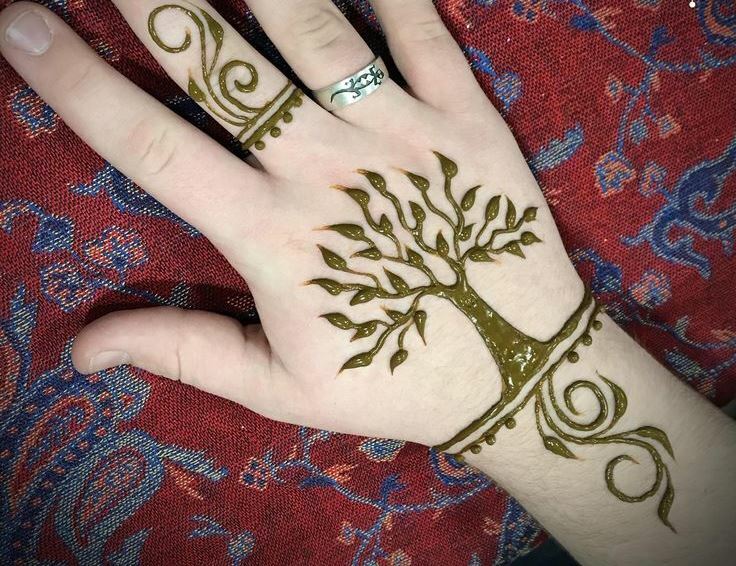 Mehndi and Asian functions go hand in hand. 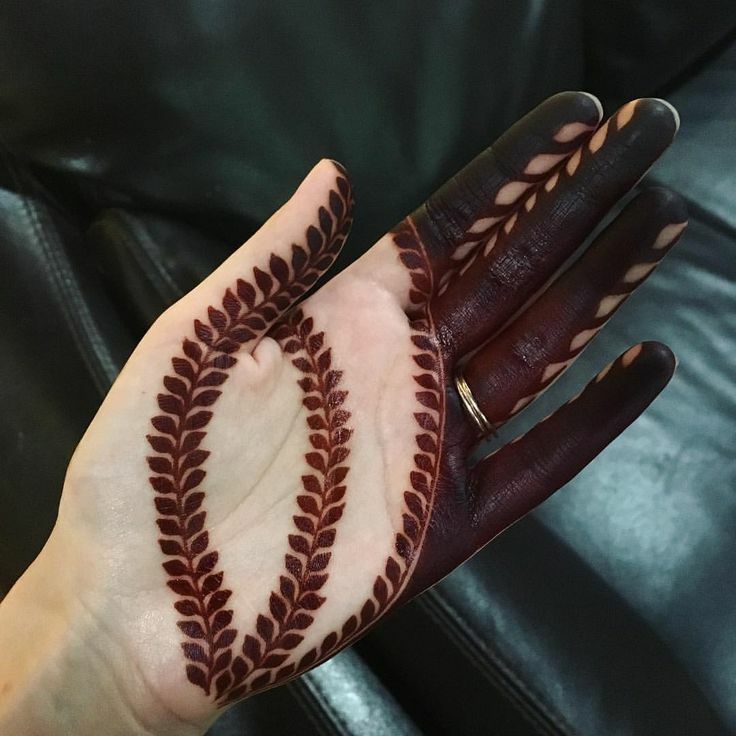 Asian women love decorating their hands with henna paste . 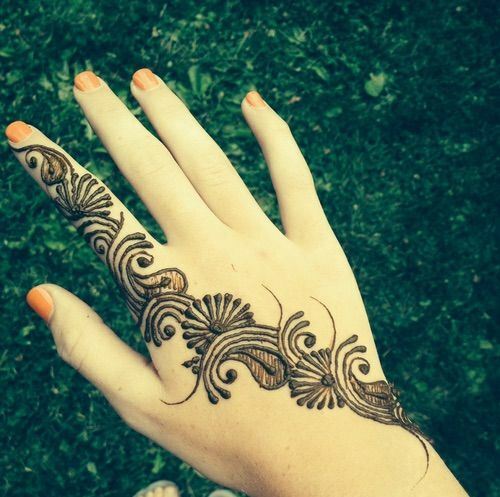 But the origin of henna is said to be from Egypt. The name ‘Mehendi’ is derived from the Sanskrit word 'mendhikā'. The application of Henna dates back to the 1400 BC when Prophet Mohammed SAW told muslim women it was sunnah to apply henna on palms. 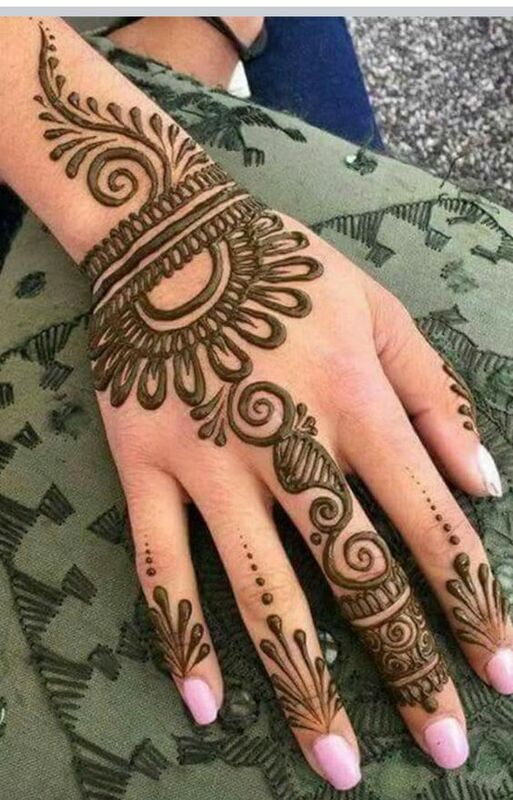 The application of henna is also found in vedic hindu ritual books. 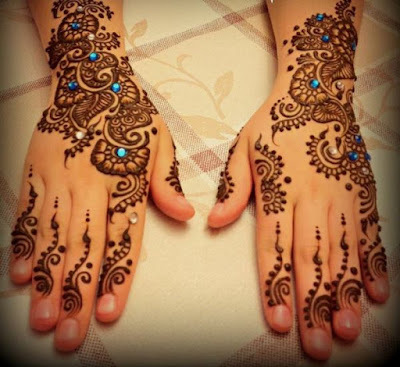 It is a tradition in India to apply mehndi on a happy occasion. Be it a festival, celebration or a wedding , application of mwhndi design is one of the most exciting things for women In India. 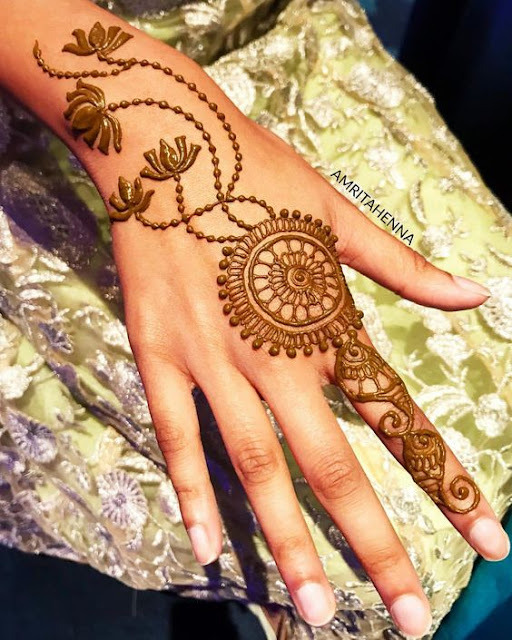 Mehendi designs are drawn from a cone like plastic that has henna paste filled in it. The henna paste inside is actually the paste of Henna leaves and can be applied on the hair as a conditioner or put in a cone to make henna tattoos. 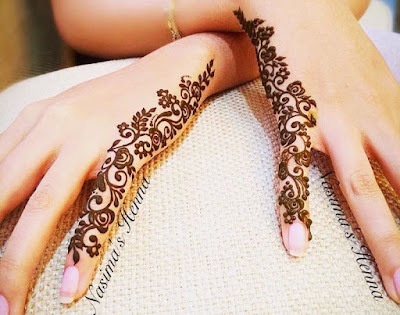 Henna mehndi is not only good for mehndi designs but also plays a an important role as conditioner for hair growth . Now coming to the mehndi designs,there are many type of Mehendi designs with the Arabic Style being an absolute favourite among young girls for its simplicity and creativity. 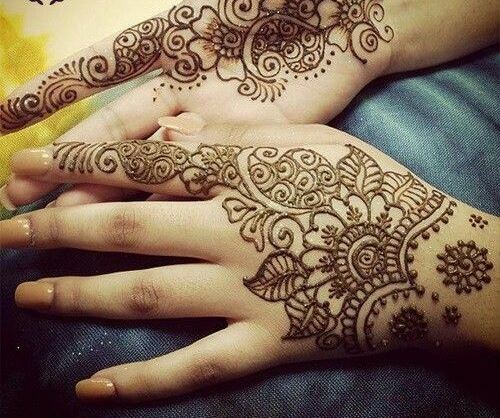 The wedding season is here and everyone from children to adults love applying mehendi . 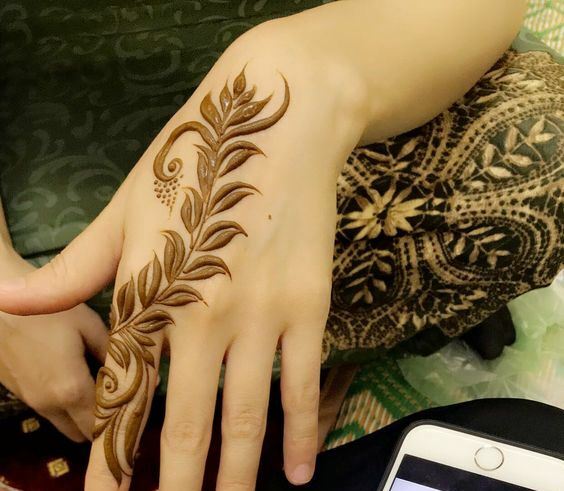 The festive seasons is not far away and with Eid right around the corner, this mehndi post will act as a boon for those who have just begun learning the art of mehndi application. The intricately woven henna designs on the hands and feet enhances one’s beauty and women all over India anticipate mehndi application on special occasions. The process of the steps included in the application of mehndi designs is very simple. 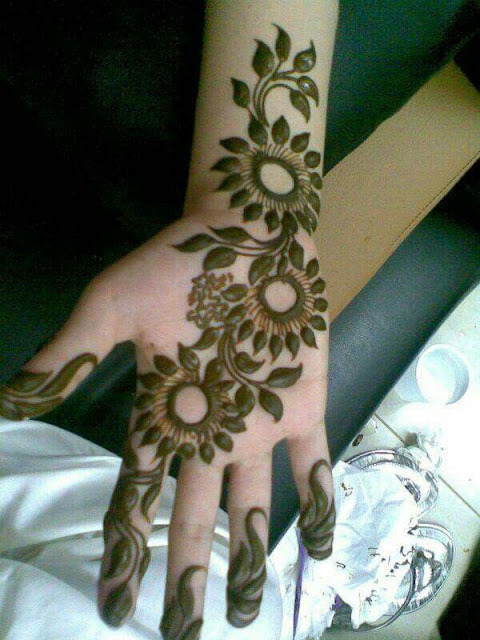 You have to simply draw a design on your palms, back of your hands, feet etc and wait for about 2 hrs. Many brides to be and married women prefer to keep overnight for deeper color impact. Don't wash away the mehndi but instead scrape it off with butter knife or remove it gently with your hands. 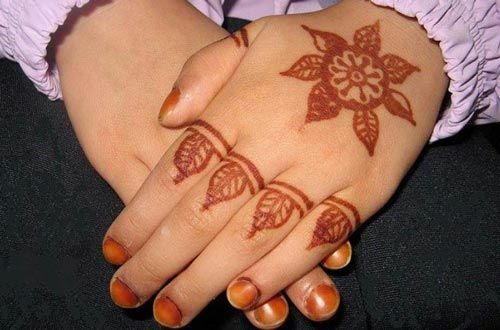 The mehendi will eventually dry out and start falling off your palm leaving an orangish-red design on your hands. By the next day the colour will start getting darker. Whilst in the Chinese mehndi form colored henna is applied directly on the hands and tattoo colors skin within an hour of its application. With mehndi being a popular rasam or tradition among the Indian weddings and festivals , a lot of women are showing keen interest in learning this beautiful art. But if you are just starting the art of mehndi it is important you take it easy and go step by step. All the mehndi enthusiasts who are keen on learning the art of mehndi have to understand the fact that 'Rome was not built in a day'. The same way you have to practice on paper and learn how to hold a cone and always remember to ever give up. Here is your answer to the most asked question' How to apply mehndi on hands for beginners?'. Hope it helps ! Practice on paper with a black pen and draw a lot of arabic mehndi designs and simple mehndi patterns that include basic floral, peacock and paisley motifs. 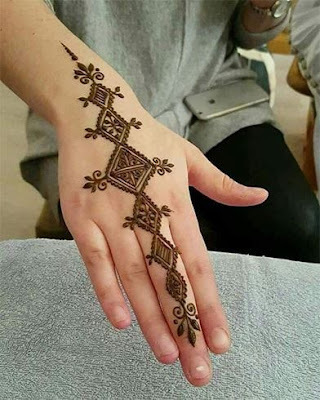 Invest a little time in learning the correct way to hold a henna cone as this is the most important step in mehndi application. Do not try complex and difficult mehndi patterns at the start of your learning process as it will add to your stress and demotivate you , resulting in giving up . 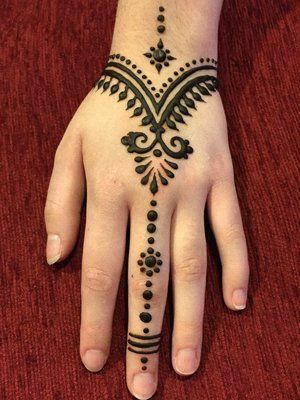 Start by picking up simple henna mehndi designs that are creative yet beautiful and the outcome is sure to boost your confidence. 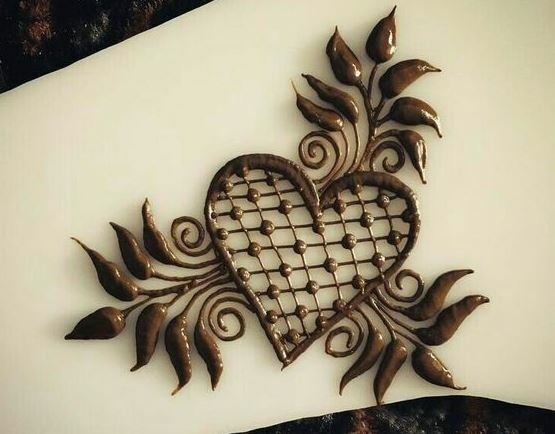 Use your creativity and draw creative and unique patterns that do not have a lot of curves and intricate detailing. 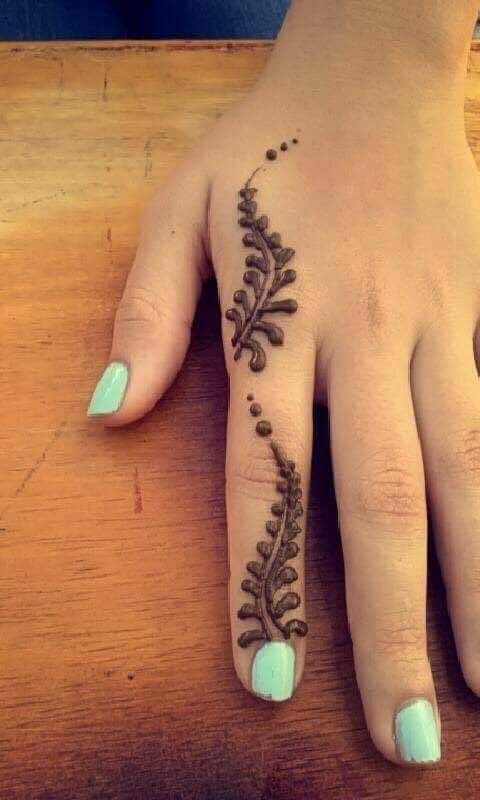 Simple designs can also be beautiful , you just have to give your best and get a little creative. Keep practicing and stick to people who will encourage you to become a pro. 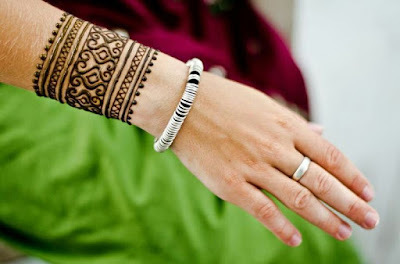 You can also take inspiration from mehndi books that have plenty of mehndi design photos printed on them. You can buy them easily from a bookstore or find tutorials on youtube. 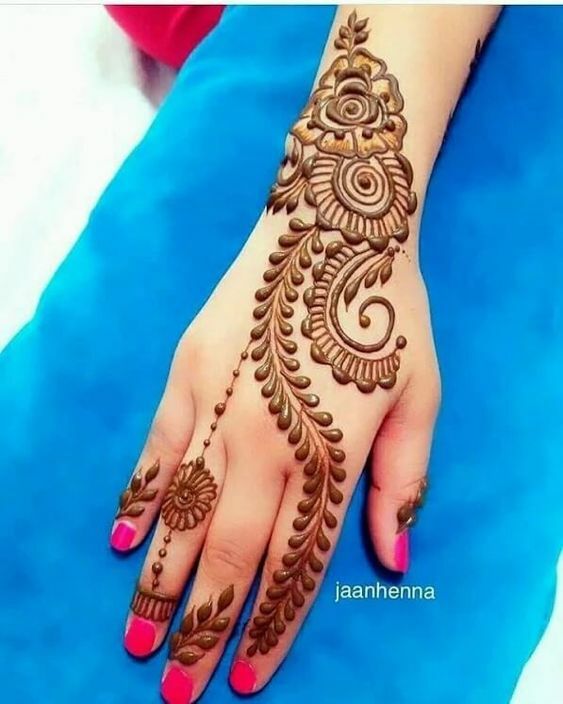 This collection of the most amazing and latest 55 simple mehndi designs for beginners will surely bring out the creative artist hidden in you. 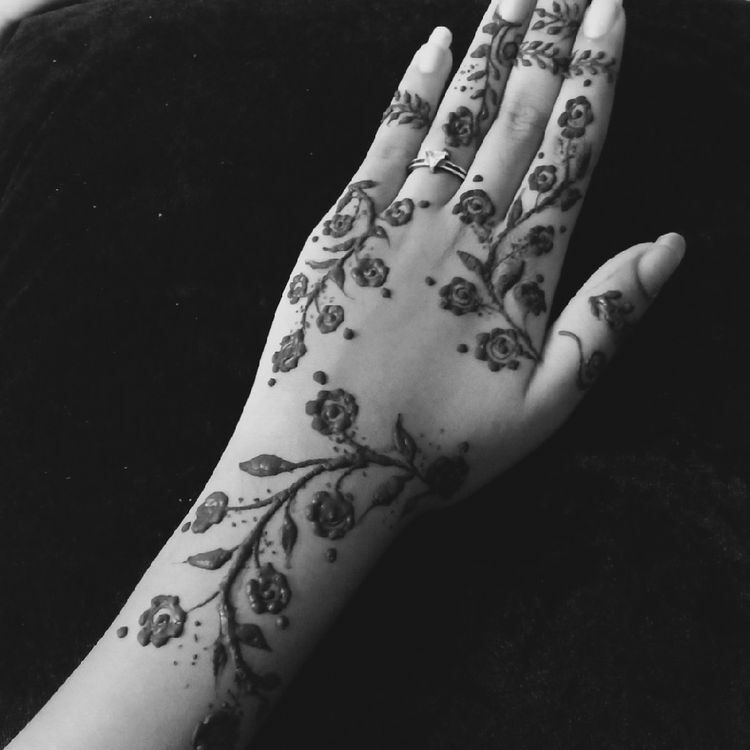 These designs might look a little complicated but trust me I had no problems and i am just a beginner in mehndi form of art too! 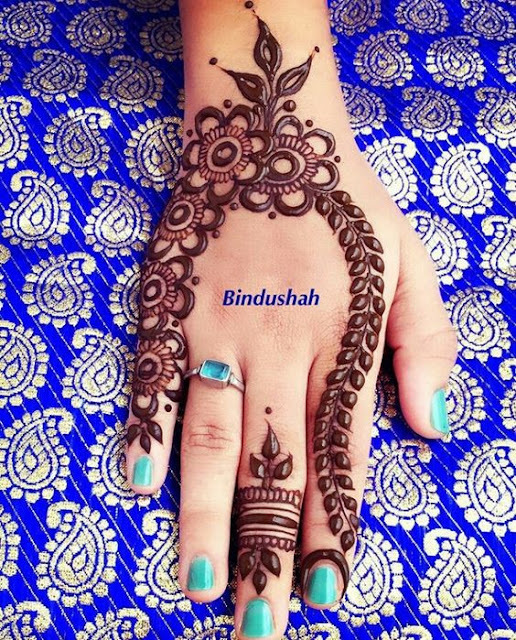 My favorite from the entire easy mehndi design collection( Simple yet effective : Between I drew Design no 9- check it out )! 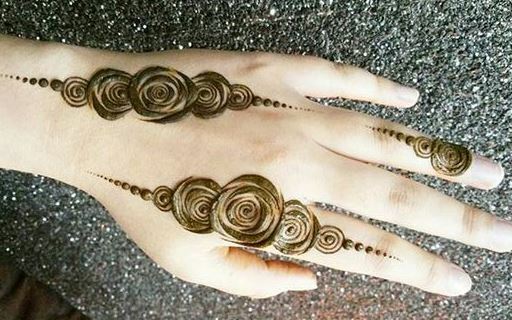 For all those mehndi lovers who want it to be easy yet very unique you can try this stunning spiral mehndi design on the front of your hands. 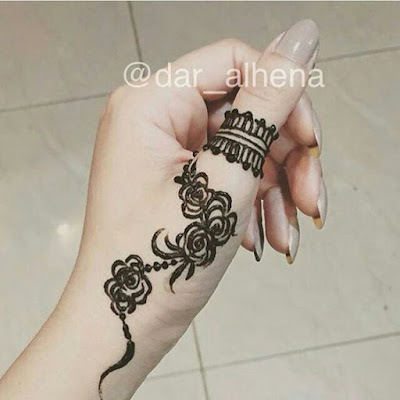 Its best to start drawing this particular design from your forefinger . 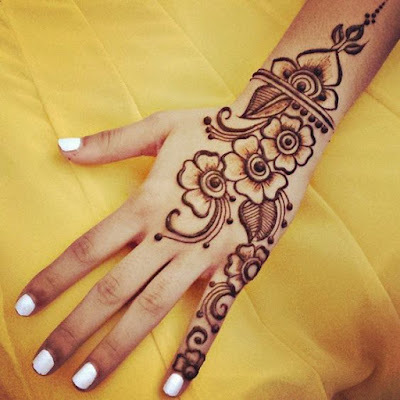 The detailing in this particular mehendi design is easy and looks oh so elegant ! 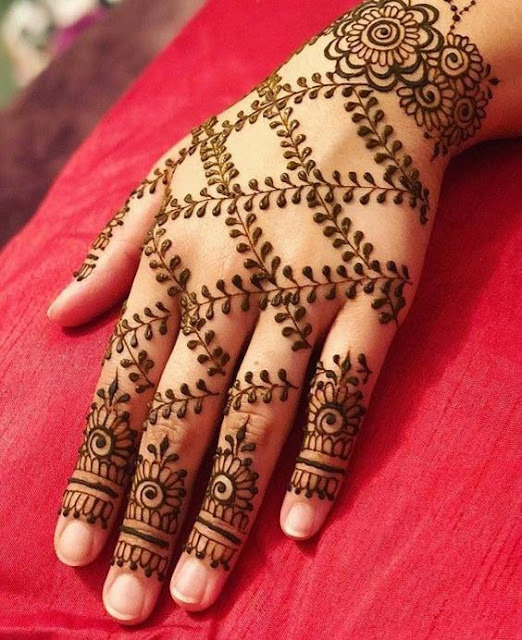 This mehendi pattern is suitable for any occasion and will look great on age groups. 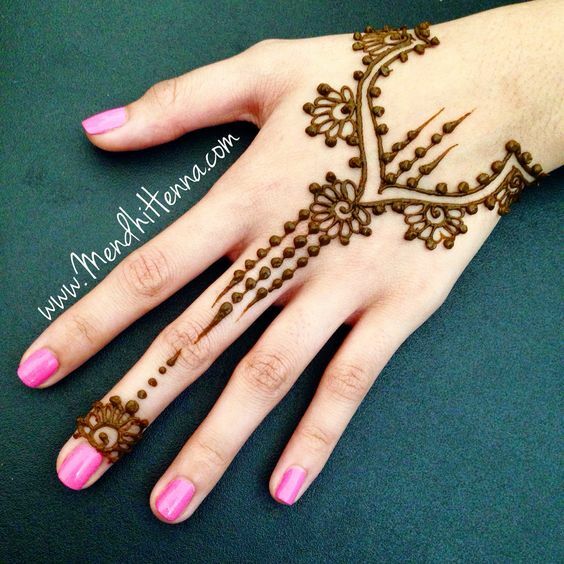 Those who like it simple and sweet can try a floral hand harness inspired mehendi design like the one below. 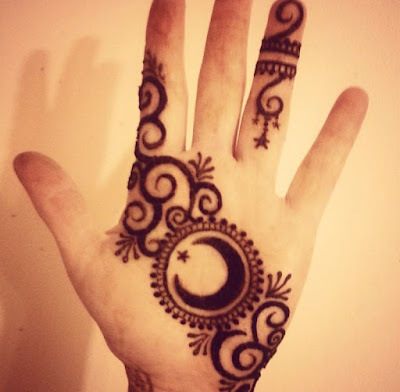 Its so easy peasy to draw and looks fabulous on the back of your hands. 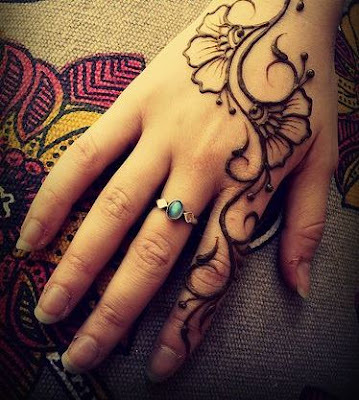 If you are planning on wearing minimal hand jewellery you can opt for this mehndi design to jazz up your look! 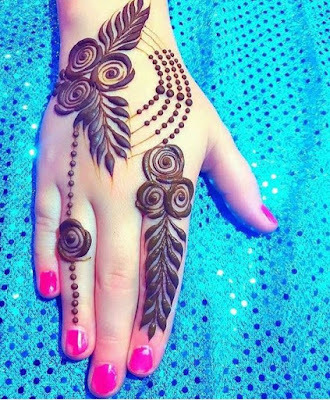 This is a great mehndi design to sport at a friends wedding or a close relatives mehndi ceremony! 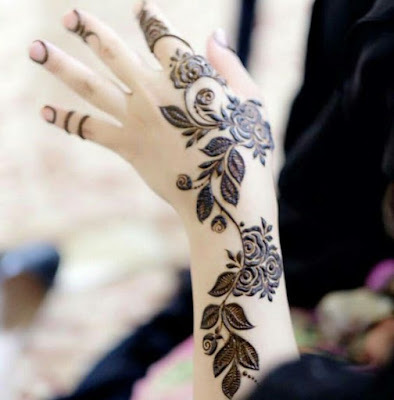 If you are all about being the most distinct when sporting a mehndi design , your search ends here. This voguish mehndi design can be done by anyone on any occasion and will look absolutely stunning on young women. 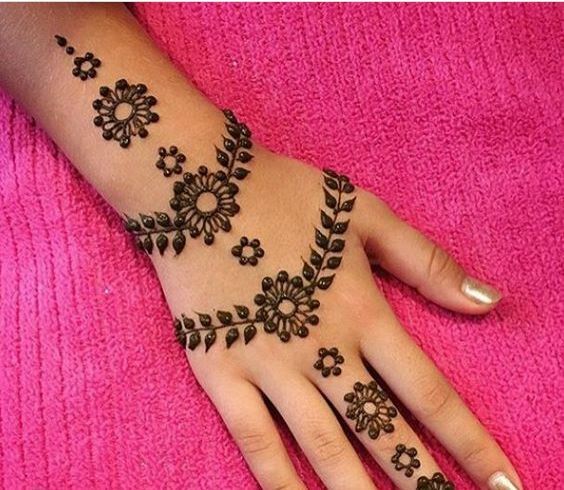 Great for college parties, festivals and special occasions! This one is a fresh mehndi design that has a modernistic appeal to it. Must try for all beginners. Trust us you are going to receive several compliments for this one! 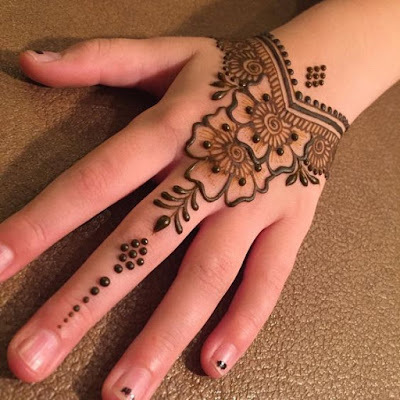 This is definitely one of our favorites from the whole easy and simple mehndi for beginner list! For all our desi brides who want to try something hatke for their wedding you can give this mehndi design a try and the best part is you can get it done in no time or do it on your own for its a simple yet chic mehndi pattern that has a jaali or a fish net kind of pattern that looks pretty even though it covers only your palms.his is also a great mehndi design for married women to carry on their Karwa Chauth celebrations for it has a beautiful full hand mehndi design appeal with a modern touch. 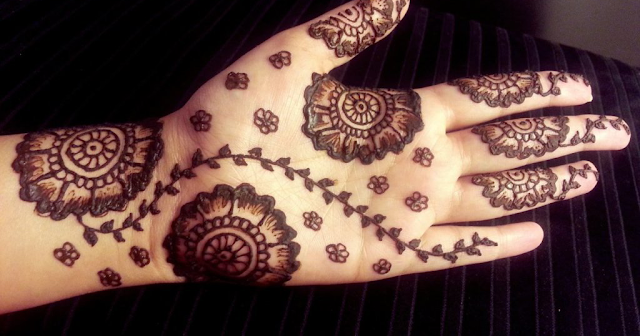 Whoever said you need to be a mehndi pro or a great mehndi artist to get that perfect mehndi artisan effect ? 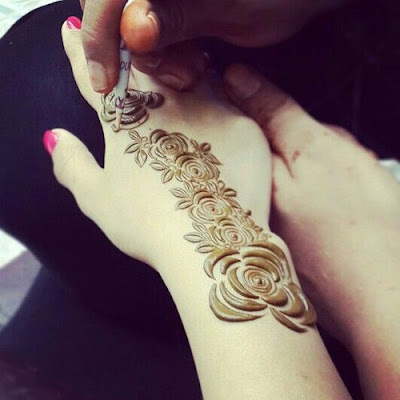 This beautiful rose mehndi pattern is simple and the gorgeous shaded roses is very easy to draw. It requires very little skill and will give a beauty parlor effect! Perfect for any occasion and the best part you can do it by your own self! If you are a minimalist lover and want something that can be done quickly and looks oh so amazing at the same time? A simple dark outlined bordered floral design with simple shading in the inner potion of the floral motif will look great and will be done in no time. Great for parties or any occasion for that matter! 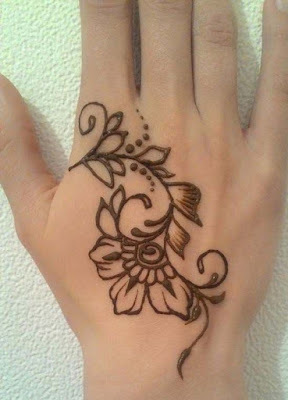 This is our second favorite design from the best beginner friendly mehndi designs for its simplicity and ease of drawing! If you want a cute and nice design for an engagement party or a friends wedding, you can consider this criss-cross kind of patterned mehndi design. Not to cluttering yet very elegant, this design is the perfect thing if you want to try something hatke! This mandala mehndi design is great way to add a hint of color to your hands and keeping the rest of your hands clutter free. 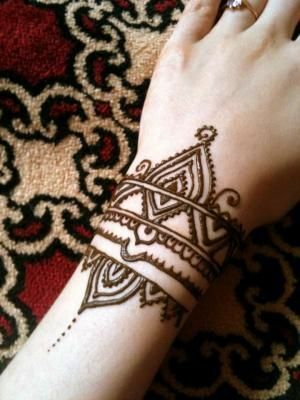 This requires very little time and will look great on palms as it has thick outlined borders that will beautify the whole design. 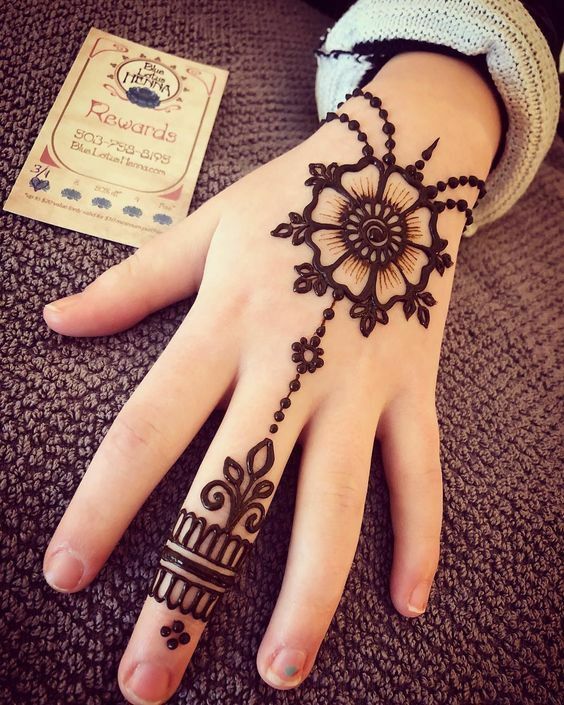 The pattern on the fingers is matched with the centerpiece mandala pattern to compliment the whole henna design. 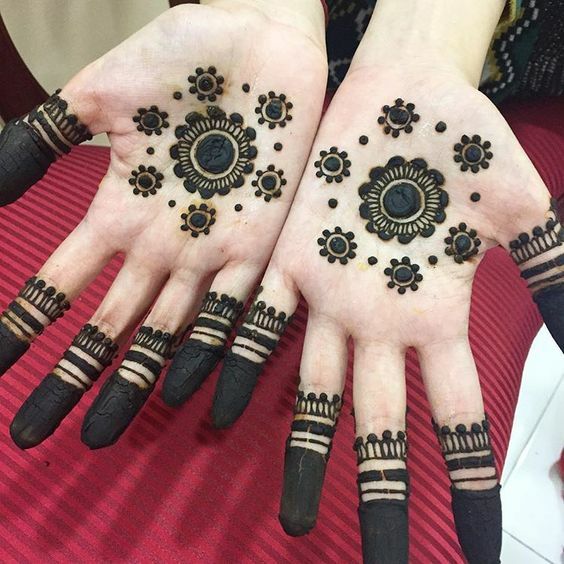 Today's youth loves to go clutter free and if you are among this group , keeping the front of your hands clean and mehndi free is what is trending at present. Opt for a dark filled in floral mehndi pattern only on the back of your hands along with light colored nails to bring in a contrast. This pretty fully filled in floral arabic mehndi pattern is not only easy to draw but the end result is a spectacular design suitable for all occasions! 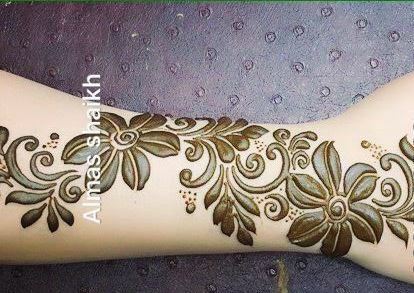 A great example for sophisticate yet simplistic mehndi form of art pattern, this particular back hand mehendi design is cleverly designed with a few inter joined semi-flower motif, leaves , dots and small fish net patterns. It gives a vibe of being very difficult but is real easy in reality. 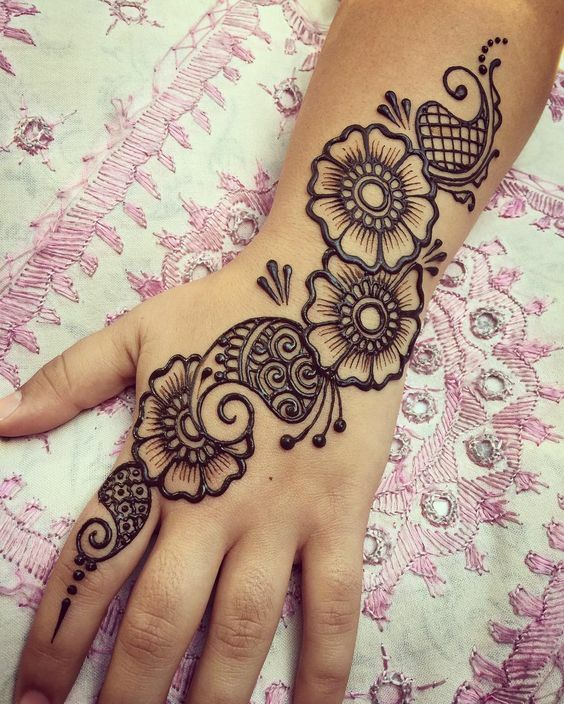 This is an amazing floral Arabic mehndi design to try on Eid or Diwali. This is also one of our favorites for its distinctness and vogue properties. 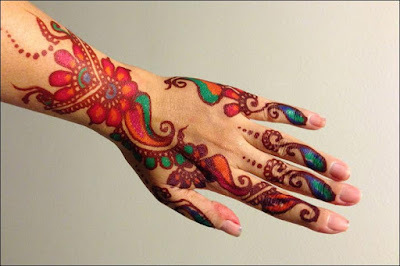 A simple huge flower petal pattern with light shading in it is what you can go for if you want an unusual mehndi design. This is apt for small functions and parties held in families. 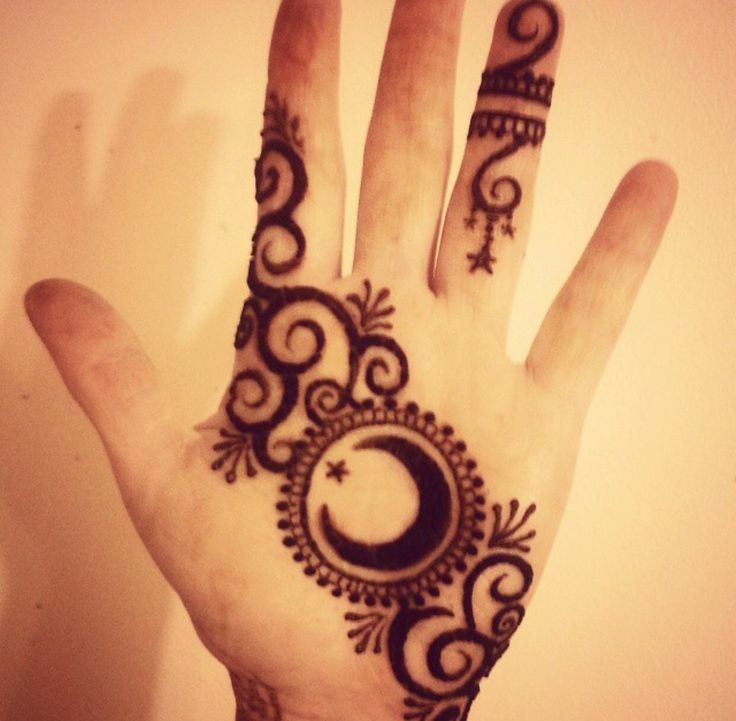 Remember to keep the rest of your hand minimal and do not go overboard with capping the fingers with henna. 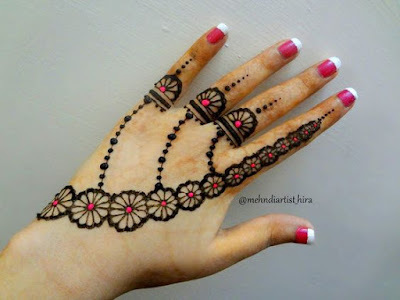 This is a very pretty yet easy mehndi pattern that begins from the wrist and ends right below your finger tips. 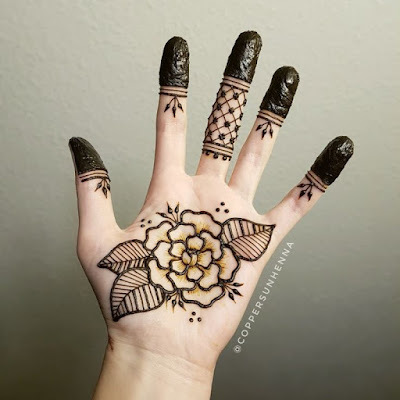 This can be tried by anyone for any occasion for its simplicity and blending ability with traditional and western attire.The floral pattern and the unique style of this simple mehndi design makes it appropriate for all ages. 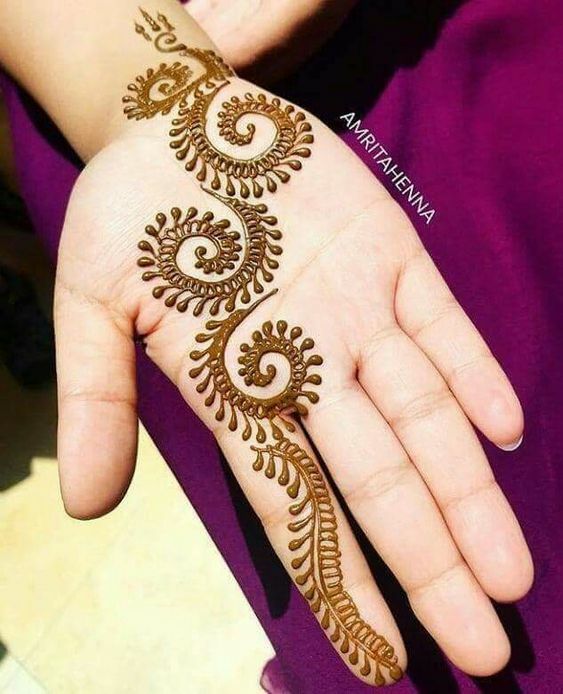 This paisley henna simple mehandi design is beautiful in every way. 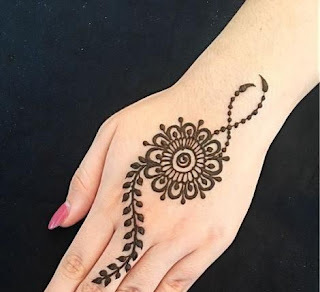 The best part thing about this floral and paisley pattern is that you can either draw it on the front of your hand or apply it on the back of your hands! 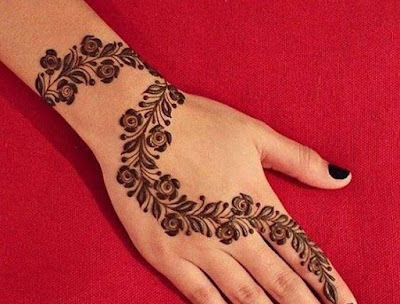 Try such easy and beautiful mehndi designs to master the art of applying henna easily. 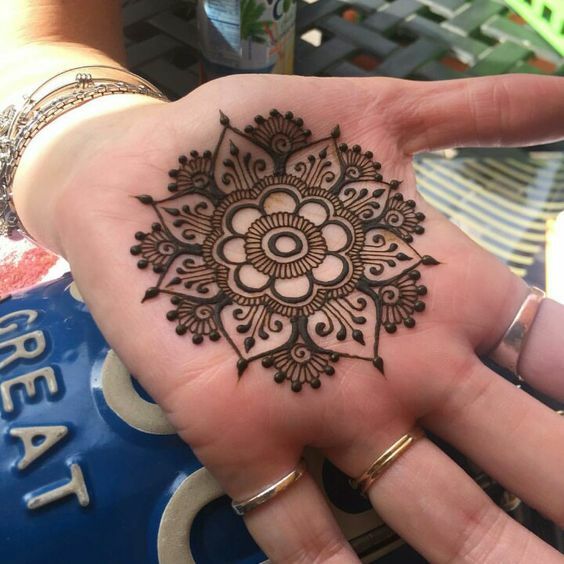 This super easy floral mandala mehndi design is simple to create and quite appealing. A centerpiece flower is further accentuated with delicate beetle leaf motif on all sides .Do give this one a try! 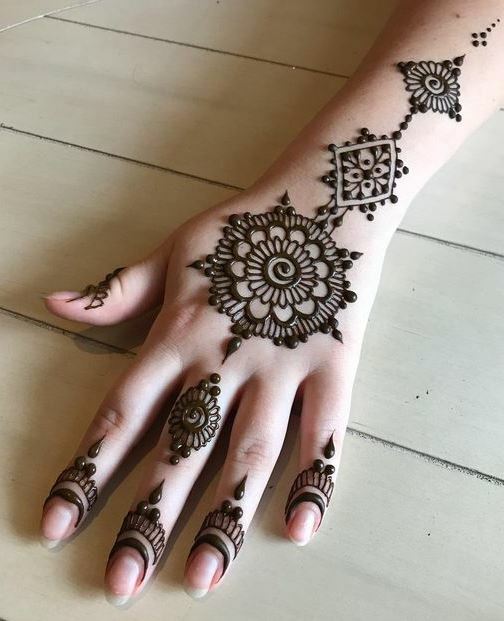 If you are attending a small function or a simple family get-together, then this sleek one sided arabic mehendi look would be the ideal pick. 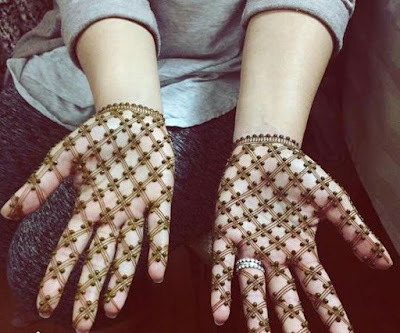 This is a very unique way to break from the almost identical patterns beginning from the center of the hand . This is somewhat similar to the hathphool or hand harness mehndi designs. 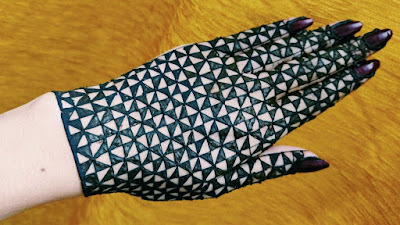 If you are willing to skip hand jewelry then this pattern is a great way to add glam to your hands. 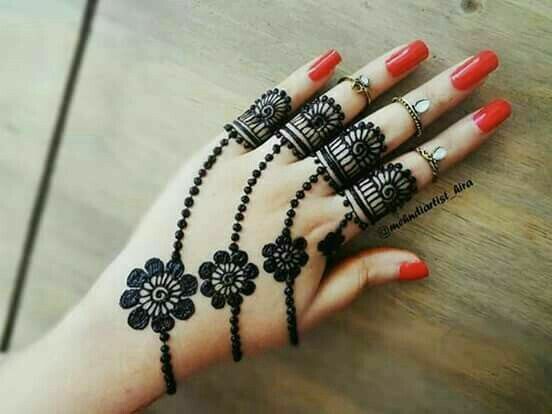 Ring like motifs are connected with dotted chains and pass through cute flowers at the right hand direction.This lovely design is sure to enhance the beauty of your hands. 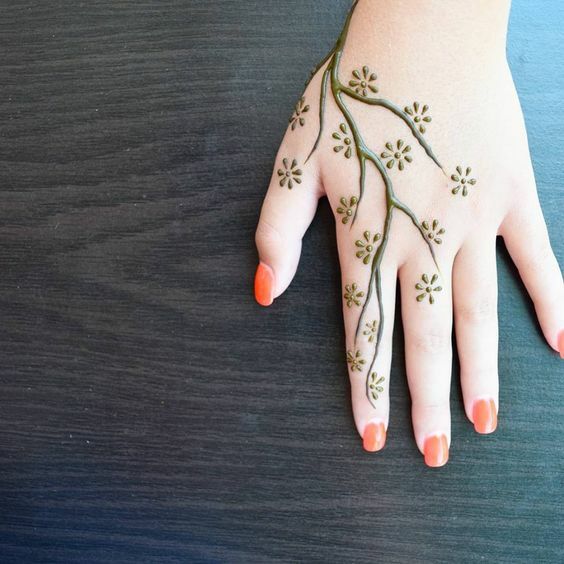 Set a new example by giving this contemporary branching out floral henna pattern. This is something very unique and hatke. Very simple yet chic, give this pattern a shot to grab eyeballs. 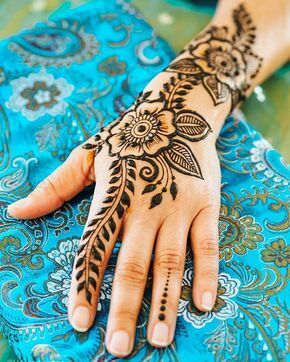 Nothing beats a beautiful freestyle floral mehndi pattern! Small flowers drawn in a creeper form with leaves sprouting from both ways looks uber chic and looks stunning in dark brown or orange tones! 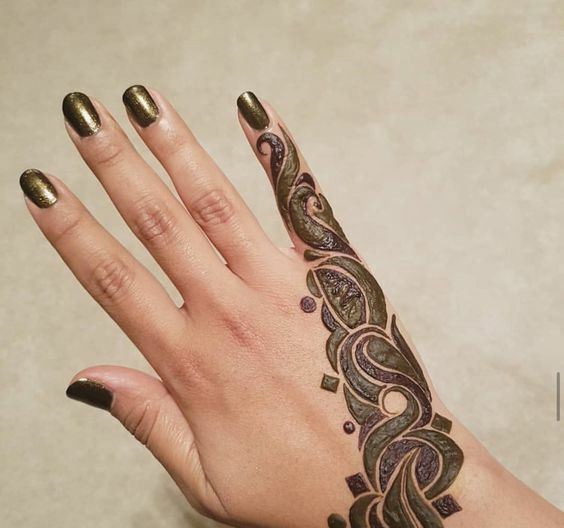 This modern mehndi pattern is artistic yet simple at the same time. Its a clean yet elegant pattern that begins with small paisleys on the index finger and gradually flows down towards the wrist ending with delicate and beautiful hanging lotuses. This is mainly a minimal Arabic style of mehendi designing which looks very pretty. This half floral and half leaf patterned mehndi design falls in the semi circular mehndi group. Thick outlined flowers are drawn on the side of the hand and connected to a finger with a semi circular leaf creeper like an arch. This one is sure to get everyone impressed and perfect for any kind of occasion. 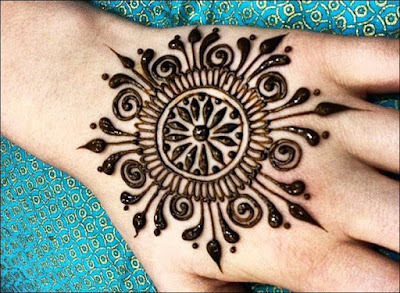 This design looks more like a jewelled ornament (also famously known as the 'Hathphool' in India) than a mehndi pattern . 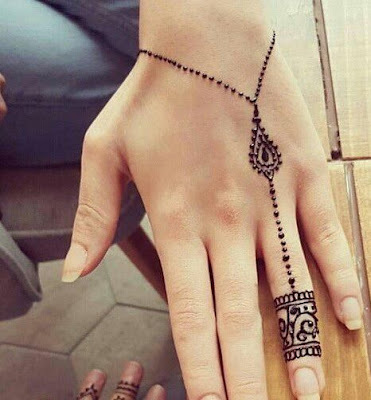 Very creative and apt for occasions when you do not want to go overboard on your hands with all the jewelries . It looks graceful and is a perfect pick for those favoring a traditional outlook. This mehndi design inspired from the Mughlai mehndi designs is super easy and an all time favorite of ours for i looks extravagant yet can be done in no time by a mehndi beginner! A combination of small sized and medium sized paisleys are connected with half and full patterned beautiful flowers . Absolutely love this gorgeous arabic mughlai pattern! 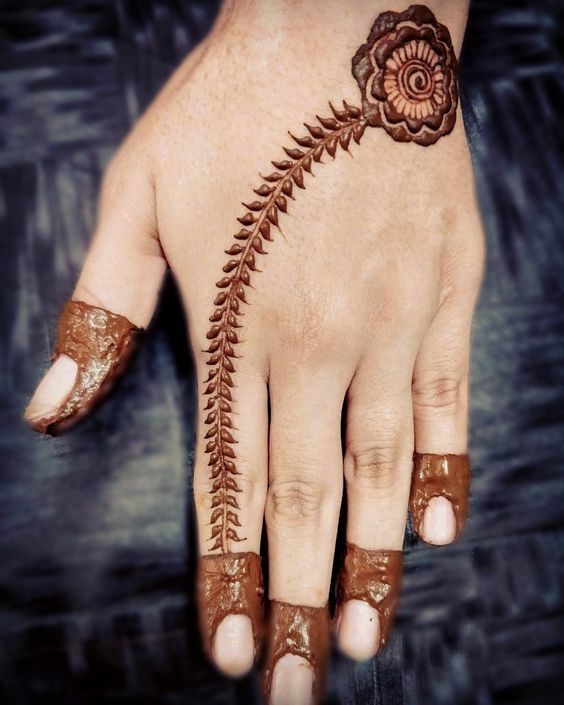 The use of small leaves in this particular back mehndi design makes it real unique. 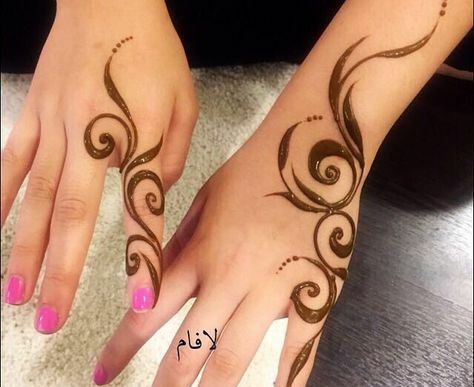 This non fussy design is very popular among youth. 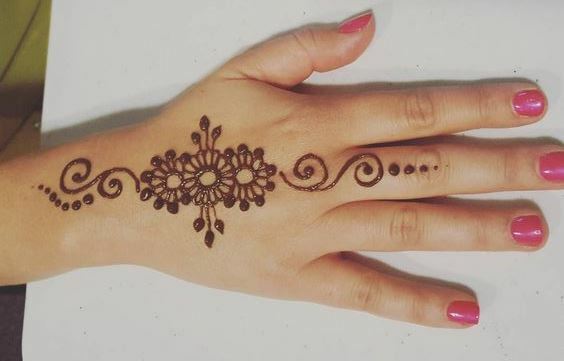 This design is easy to create and can be done in less than a minute. 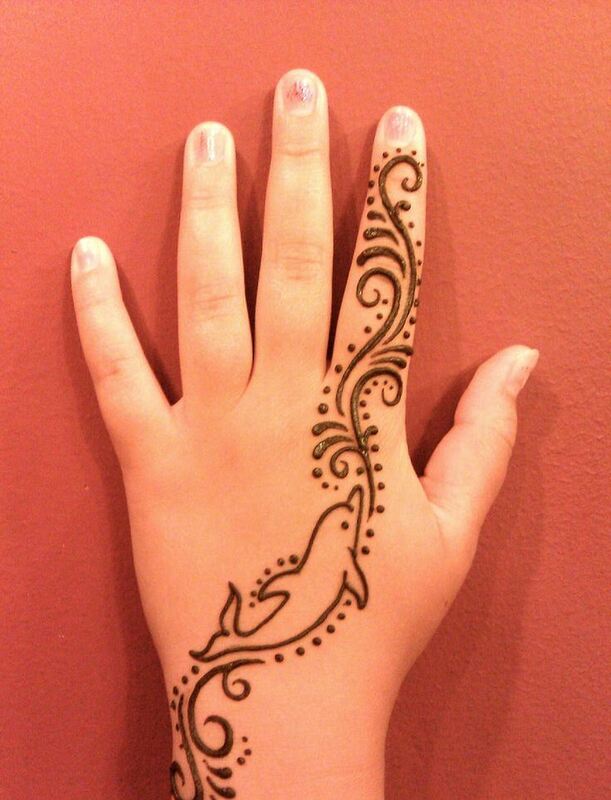 For those of you who love to apply henna but don’t like to wait till it dries, this one’s for you girls. 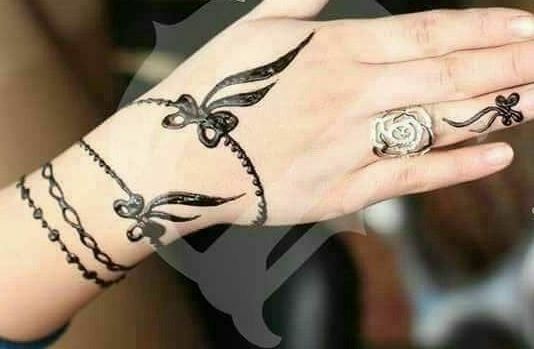 This is yet another creative minimal design for your hands when you want everything to be limited yet want to garner attention to your hands. 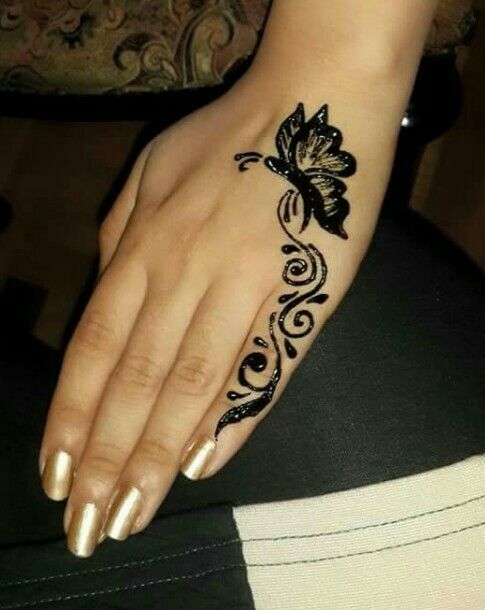 Draw this cute butterfly motif along with a single bel/creeper in the upward direction on your pinky finger. 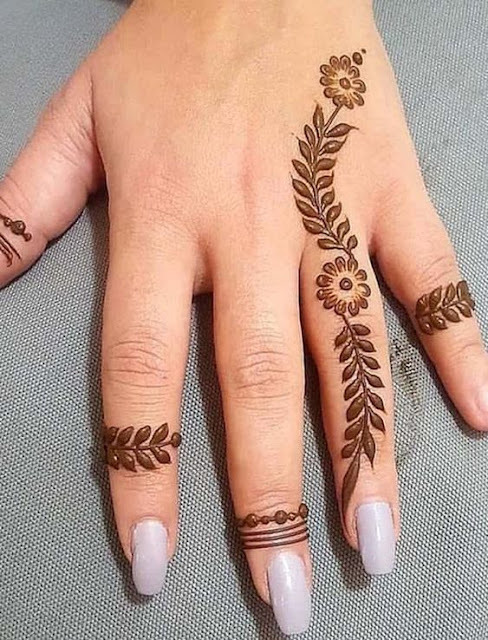 If you need a simple design with very less motifs and which is basically restricted to just the fingers of the back of your hand, try this super elegant design. The design on the back of your hands is quite easy to do and looks simple enough for any occasion. It will suit women of any age, be it your kid or yourself! 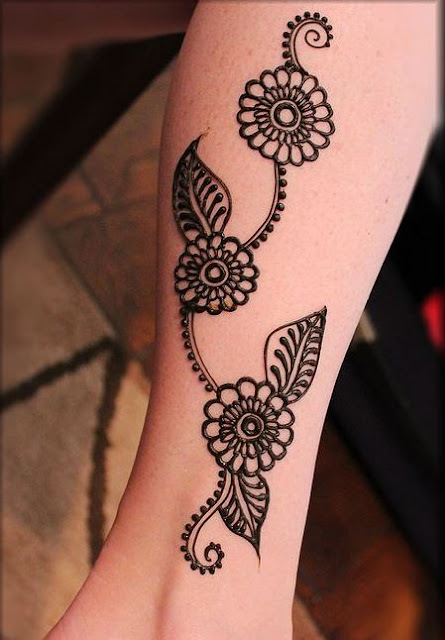 Want a design that can be drawn in a span of five minutes and yet looks super chic ? This one is for you girl! 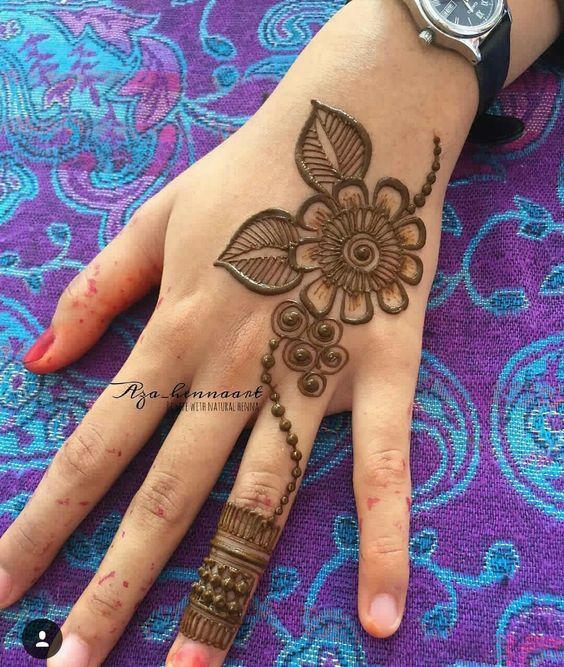 A single floral motif with a curved leaf bel bending towards the forefinger, this mehndi design looks gorgeous when done on back of hands and finished with capping the tips of your fingers! 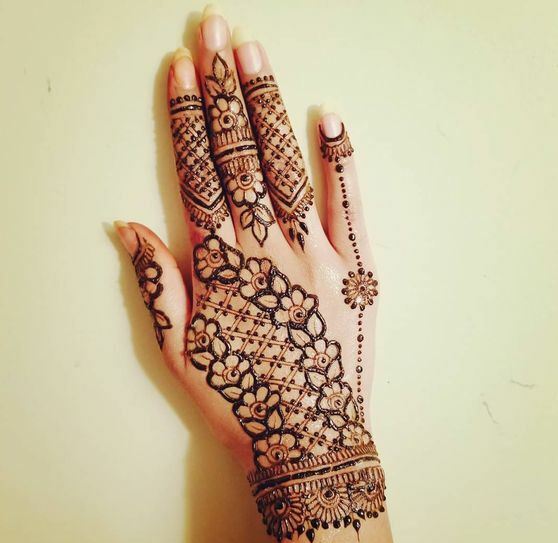 Jewelled hathphool designs has been an inspiration for all the mehndi artists since a very long time. 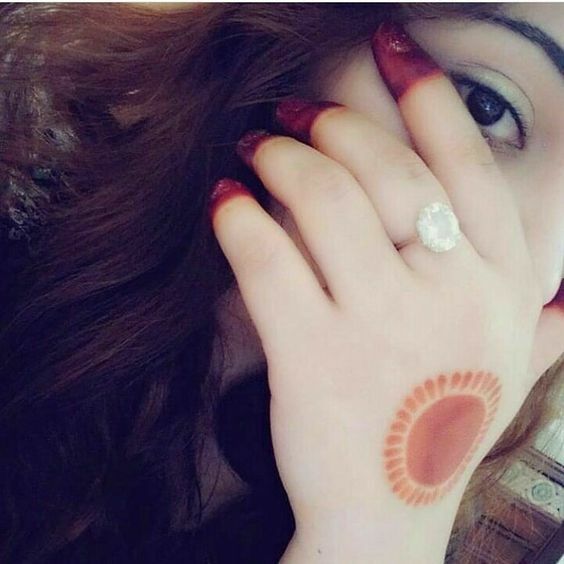 jeweled mehndi designs can be difficult to copy on hands but this pattern is the easiest and looks mesmerizing when drawn on your hands. The single flower with its dark outlines looks even more gorgeous when connected to the middle finger with delicate floral motifs and leaves. 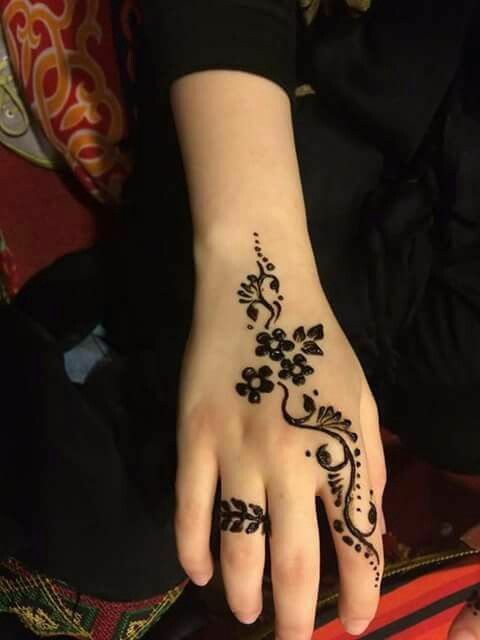 This one can be done on anybody be it your daughter or your mother or even on your own hand. 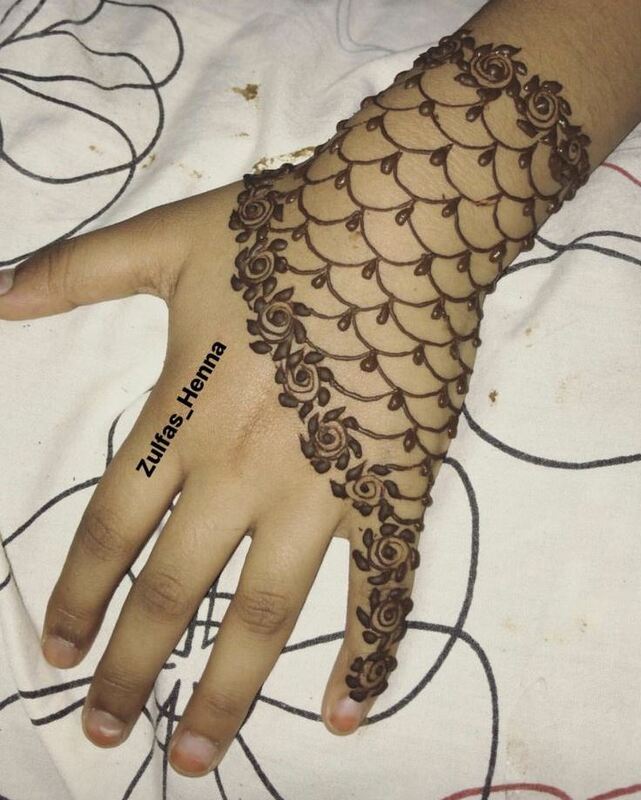 The design is mainly done on the entire index finger and all the other fingers are left unattended. It is quite simple but still can be easily done for any occasion to draw all the attention to your pretty fingers. 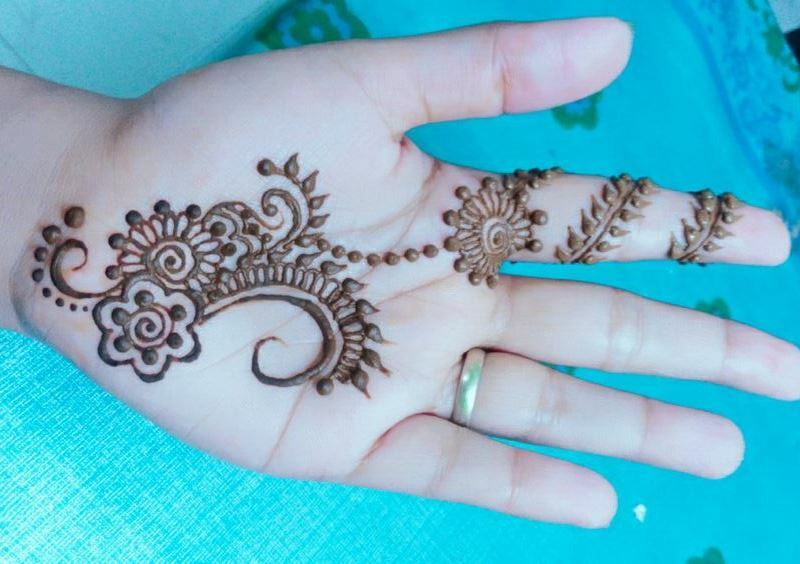 Give this one a try if you are attending an engagement ceremony or the Sangeet ceremony of a friend’s friend! This design with its beautiful floral motifs and adjoining leaves and bels looks stunning and the fineness of this pattern is magnificent. 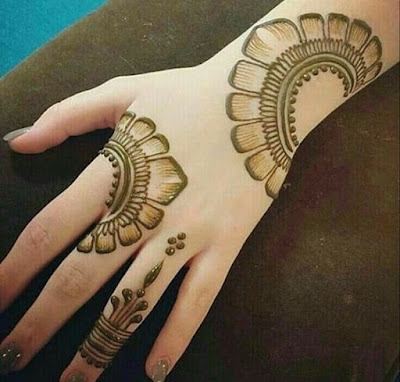 This design does not fill your entire hand and leaves gap which looks artistic from every angle. This design will surely raise the glamour quotient a few notches up. 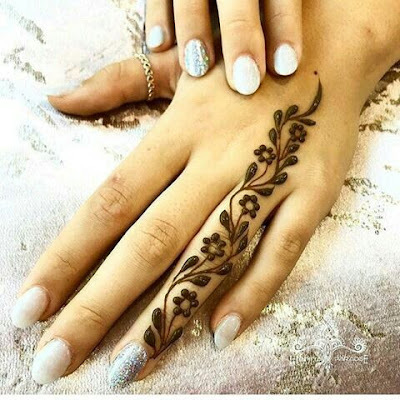 A very beautiful and delicate floral bracelet is draw at the wrist of the back of your hands and joined to the finger with a chain life dotted motif to form a hathphool. 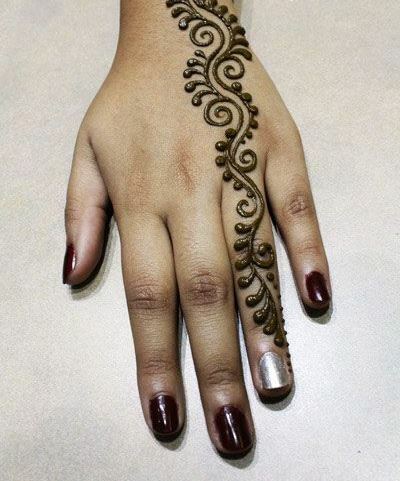 If you are planning on skipping hand jewellery then this is a great way to beautify your hands . If you are wearing a full sleeved dress that is heavily embellished and studded you might want to go easy on the mehndi pattern and accessories, unless you are the one in the limelight. 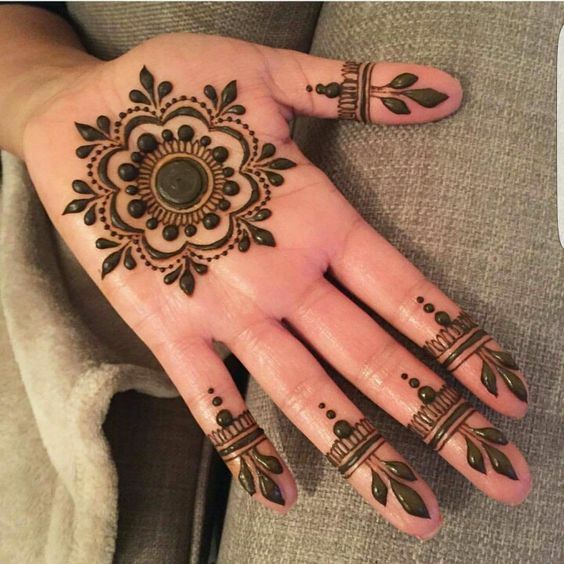 This is specially applicable for women who don’t like heavy mehendi designs and want something minimal to go with their heavy outfits. 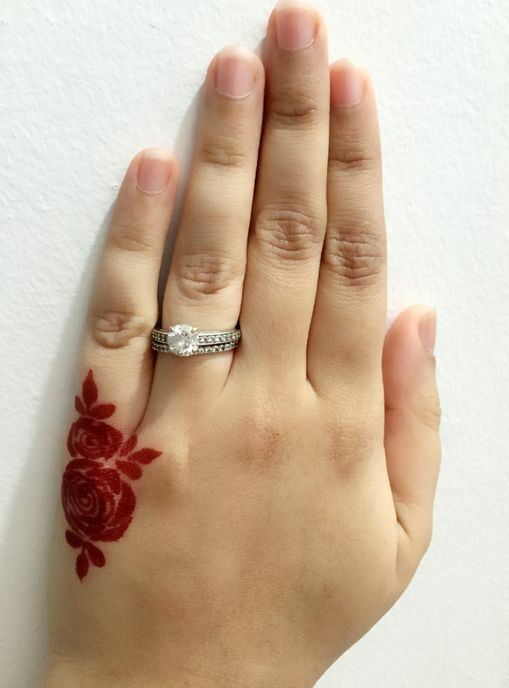 It will look very really pretty if you do this on your thumb.Small roses are stringed together and a simple ring is drawn on the thumb to accentuate the design further. 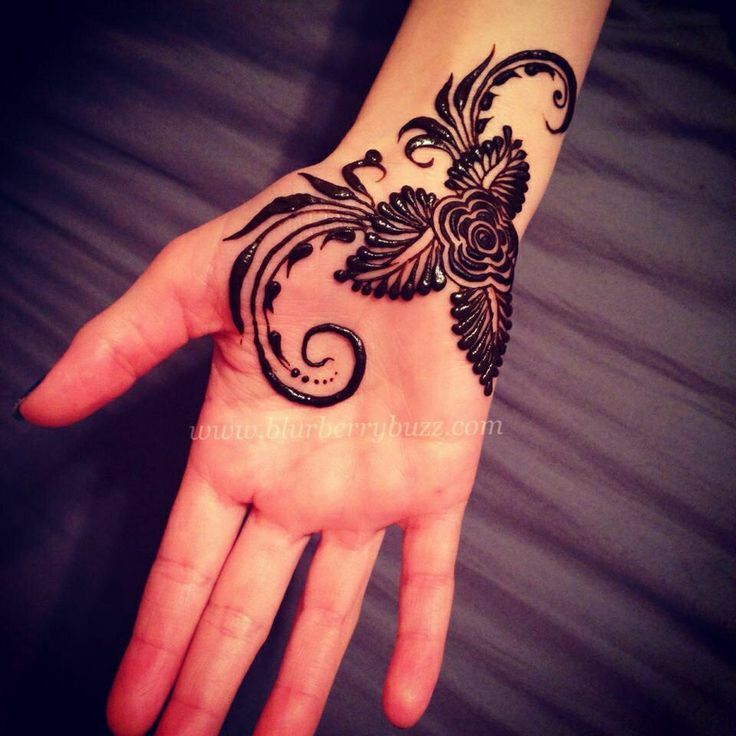 Here’s another modern version of a rose mehndi henna design. 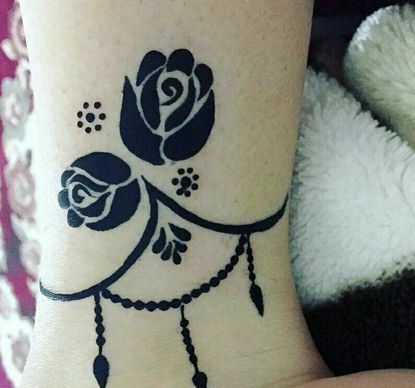 This design looks interesting with trio roses and different dotted patterns along with leaves These are modern versions of Dubai rose mehandi designs and can be done easily by anyone. This simple dome shaped mehndi pattern that looks like the exterior of a beautiful mosque is an amazing design for girls who want a quick design on the occasion of Eid or any religious festive occasion! 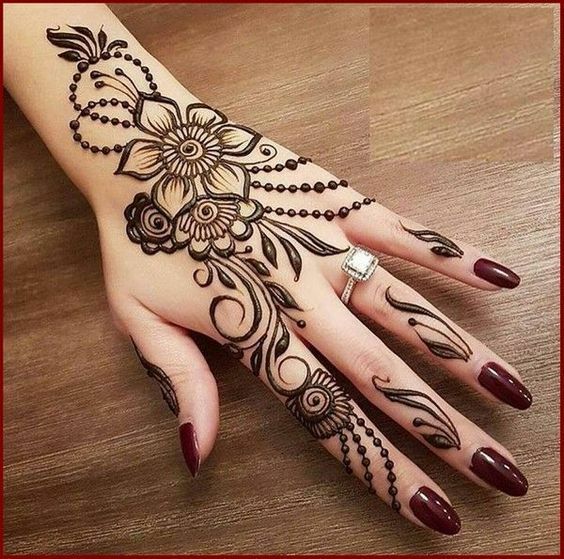 Absolutely love the delicate floral motifs drawn on the dome..
A single huge beautiful flower motif is the centerpiece of this henna pattern and the fingers are left empty to draw all the attention on the gorgeous flower. Great for small kids and one of the easiest kids mehndi designs for this year. 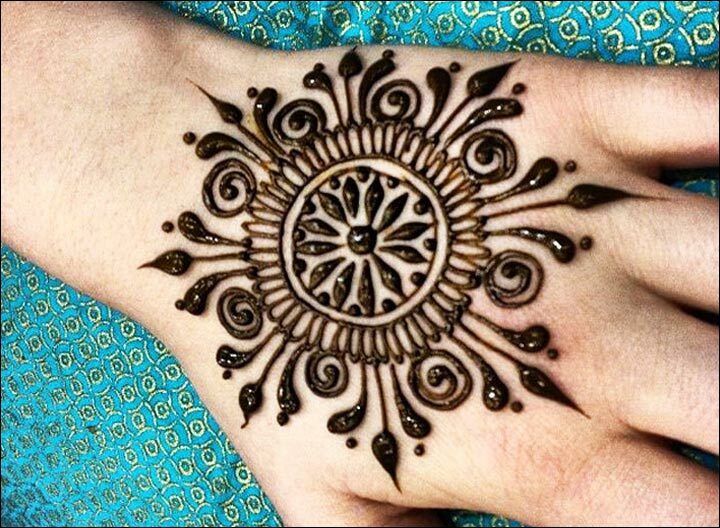 This one is definitely a different design from the usual mehndi styles we are accustomed to seeing. 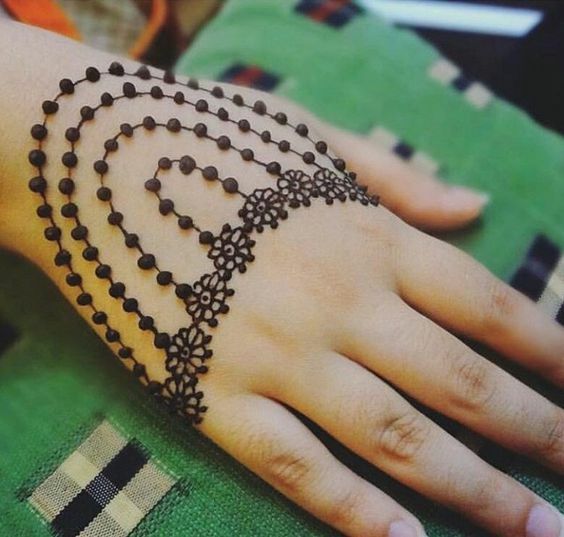 Inspired by hand jewellery, this design is predominantly simple, yet it is unique. Perfect for a modern woman, who likes to mix trendy with floral patterns. It doesn't get easier than this simplest mehndi art. 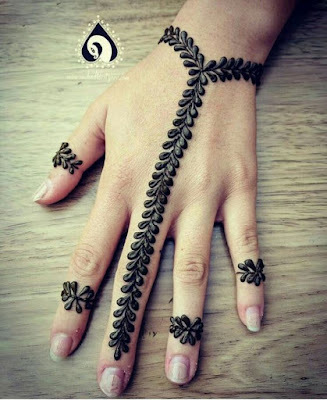 All you have to do is draw a wavy leaf pattern on your pinky finger extending it till the wrist and complete the design by adding ring like leaf vine patterns on other fingers. Simple And uncomplicated! 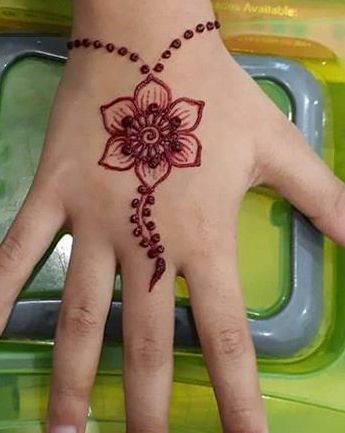 This is a super cute design and great for a beginner as this is one of the easiest designs when trying your hand at applying mehndi by yourself. 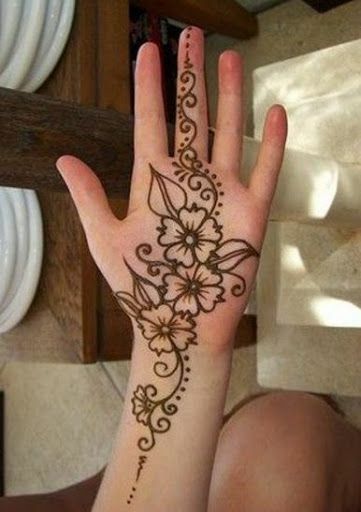 Pretty basic mehndi design which you can easily draw on your palm, back of your hand, or even your feet. A single huge flower henna pattern is on the trend for its easy and effective appeal, not only is it great for mom's who want a pretty and quick design to draw on their little daughters hands but also a design that is not hard and saves time. 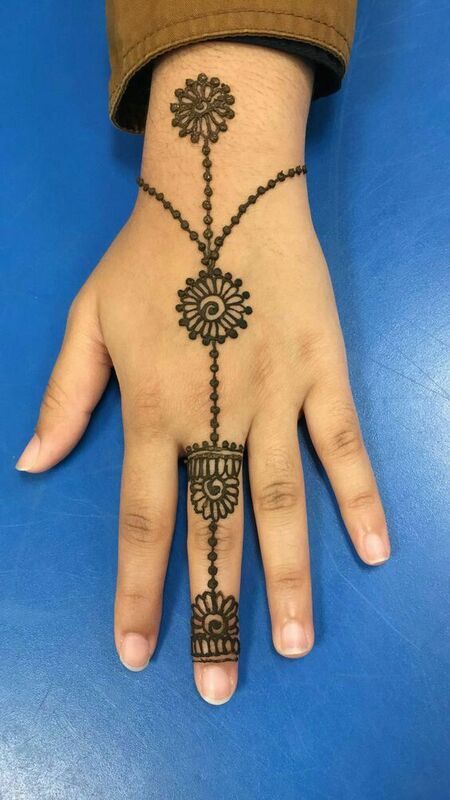 one look at this design and you know you want to create this one on the next big occasion you are attending. 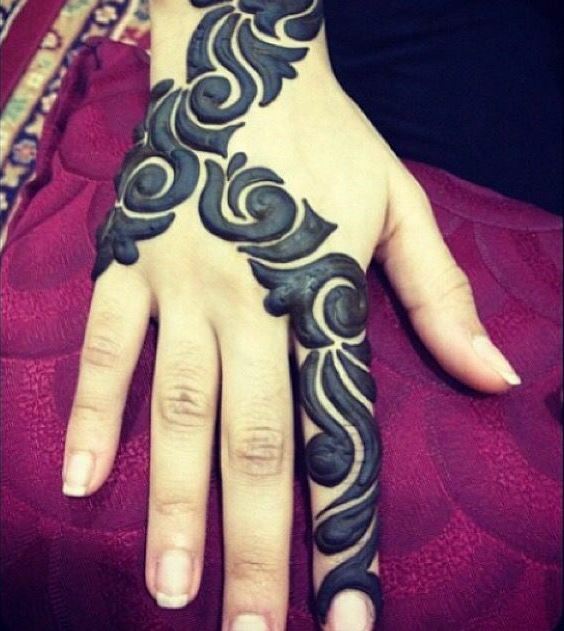 its so simple to create and looks elegant when done neatly on the back of hands. 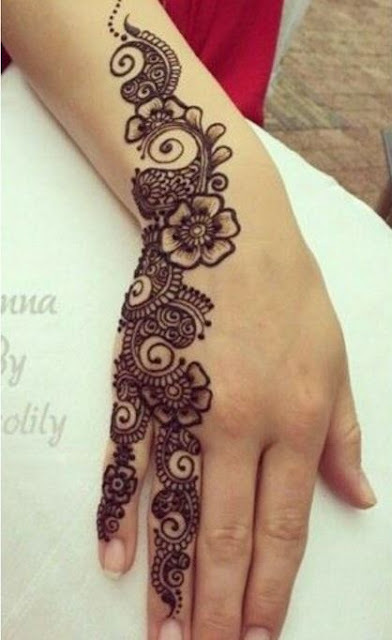 This is a very different style arabic mehndi pattern that would complement both traditional and western attire. Flaunt this on the next event you want to shine in. Very stylish and super easy! If you are not fond of intricate detailing or floral motifs then you can give this mehandi design with lots of dots and minute leaf patterns a try! 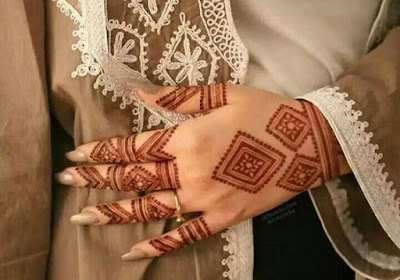 Arabic designs have an aura of themselves which captivate you and mesmerize you, this arabic mehndi pattern with curvy small floral vine like pattern on the back of hands is not only alluring but can be drawn b any mehndi learning beginner. Lovely and feminine ! 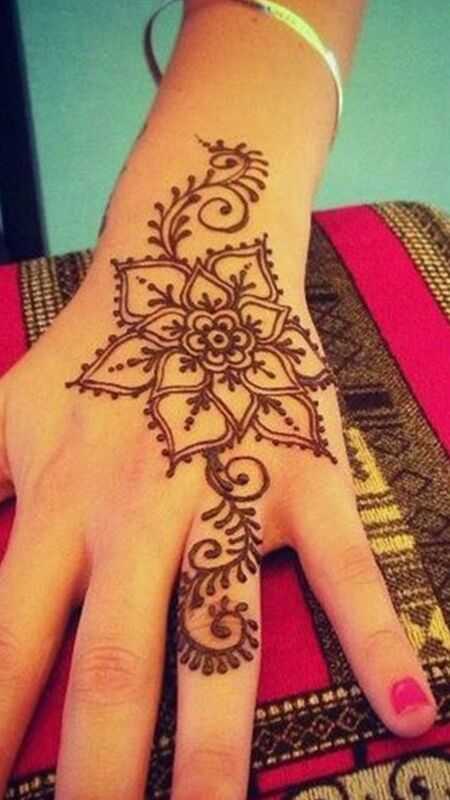 This is a graceful and elegant design and can be drawn on multiple occasions such as youe besties sangeet or your college fest. 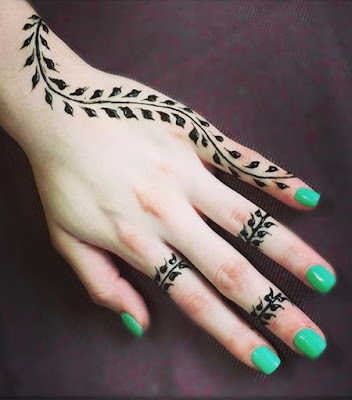 Also this design does not require very much precision and is not complicated so you can incorporate it the next time when you want to colour your hands with henna. If you are willing to go for a simple mehndi pattern for Rakhi then this beautiful and effortless small mehndi pattern that looks like a gorgeous rakhi on its own is the one for you! Plus its painless and easy to do this design. 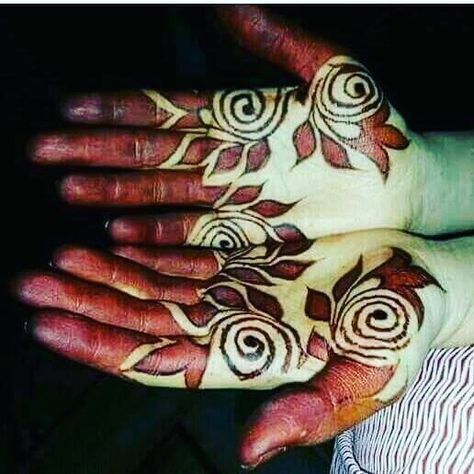 One of the smartest ways to draw a creative yet simple design is to choose a pretty floral motif like a rose or a marigold and draw it in a manner that it covers half of the side of back of your hands and runs on the opposite direction on the lower portion of your hand. If you are the kind of person who dislikes mehndi designs that are entirely filled up, then you can go for this! 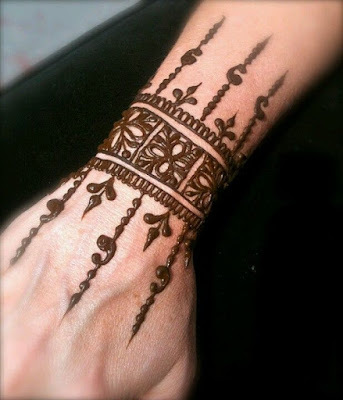 This stunning arabic mehndi pattern is kept simple and classy without over doing the work much. 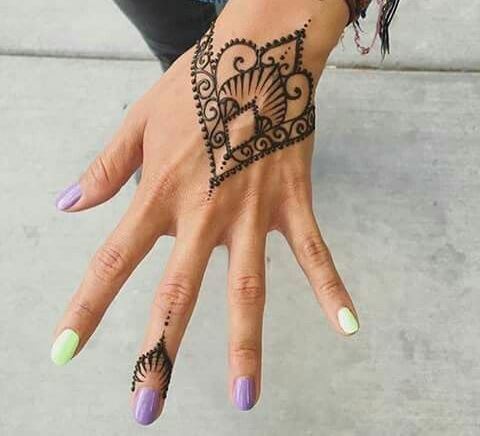 You can also match your mehndi with your outfit ,yes ! 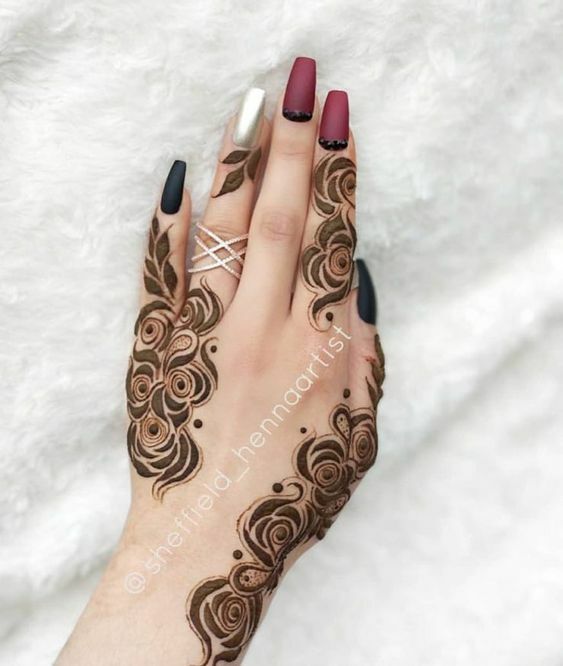 Use a long staying liquid lipstick that matches your outfit and get creative when it comes to coloring your mehndi pattern. 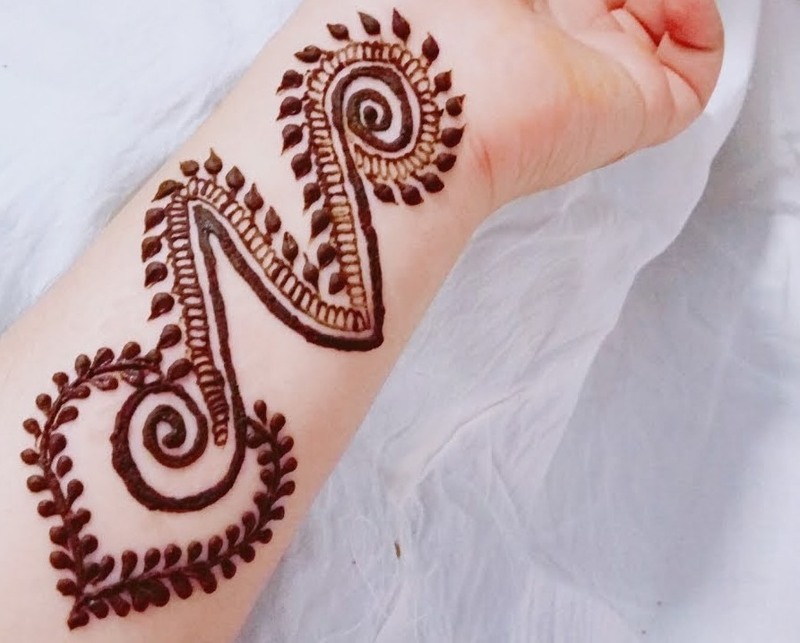 This coloring trick is sure to take your mehndi application to another level. The overall effect is one that looks like you have put in a lot of effort but something that can be achieved within minutes! 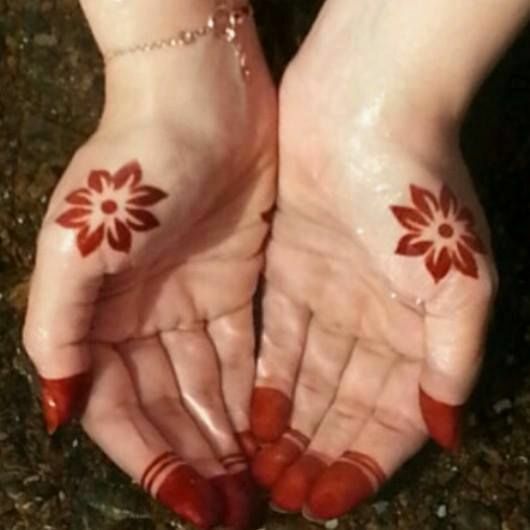 What better than learning to perfect a single flower and using the same motif to create a gorgeous mehndi design! 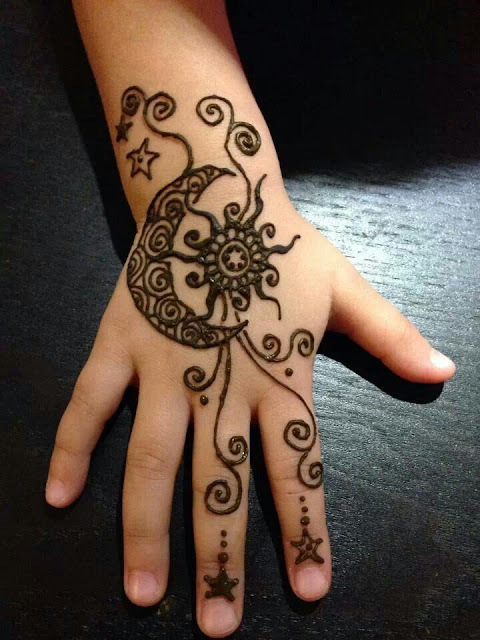 The time invested in learning is less and the end result is this spectacular mehndi pattern ! 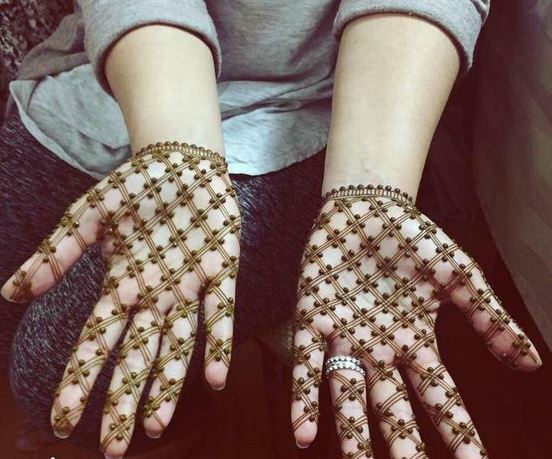 You have to agree on with us on this for being the most time saving mehndi pattern covering the full front hand. Incase you are fond of simple floral mehndi patterns that are clutter free and do not cover the whole palm , you can give this small and simple mehndi pattern a try. You don't need to be a mehndi pro to draw this one, its pretty and the outcome is amazing! 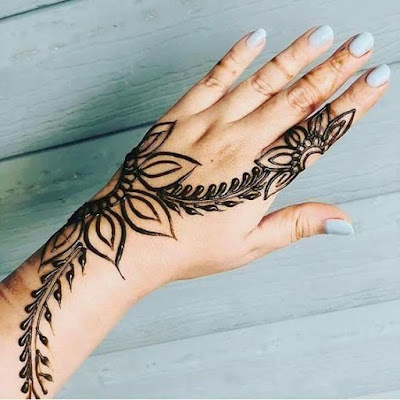 Colorful henna patterns are making a comeback this year and this stunning henna pattern is perfect for starters who want to try their hands on following this trend. 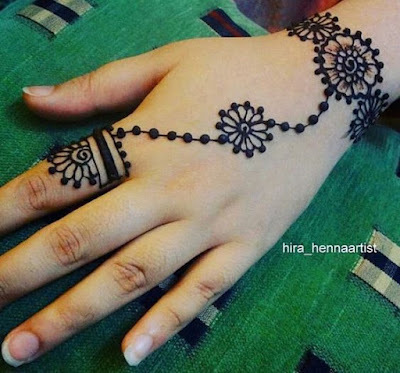 Natural henna is not used in these type of mehndi designs instead temporary coloring paste that has coloring ingredients in it are used to draw beautiful patterns. 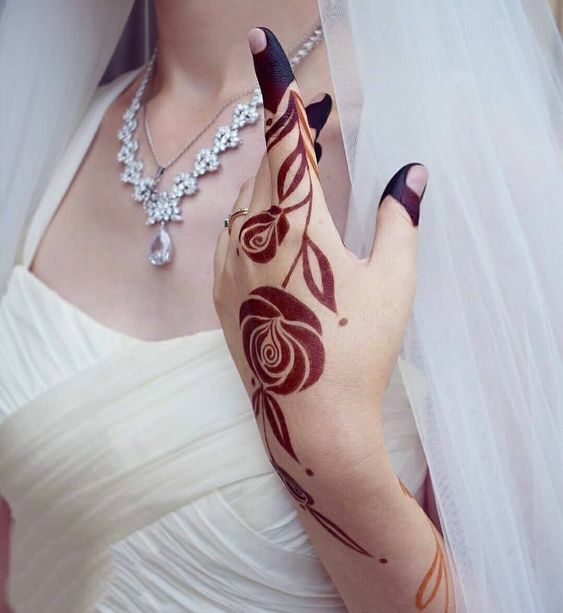 The color left by this is deep dark reddish in color and takes less than an hour to color completely on the hands. 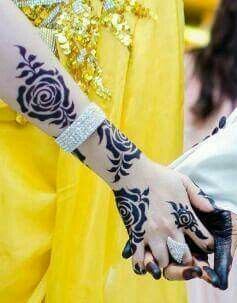 This is a famous mehndi design trend among western countries. 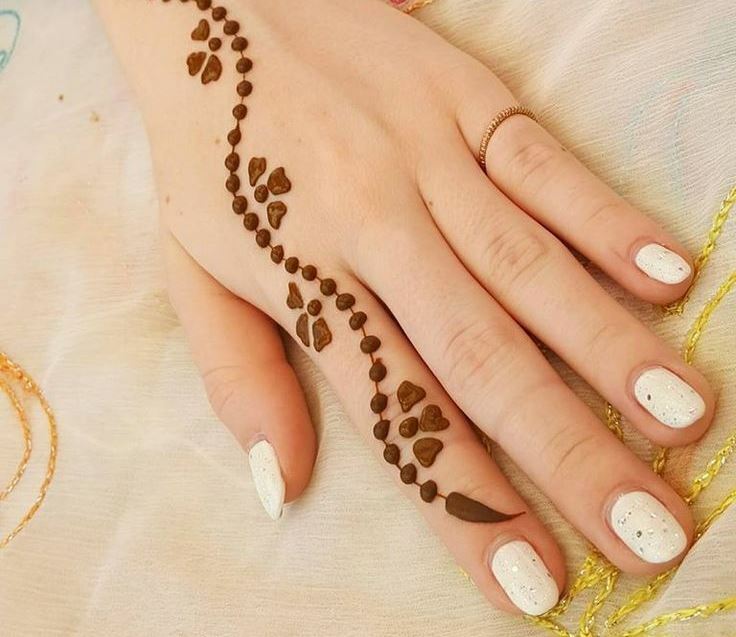 Colorful studded stones and rhinestones add to the beauty of this pretty arabic mehndi design keeping it fine and beautiful without getting too messy and filled up on the feet. The stones used in this design adds an Indian touch to the design! 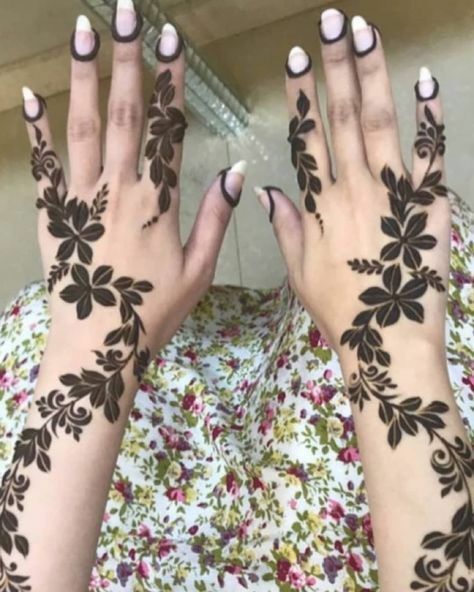 Completely filled in bold mehndi patterns or Bharwa mehndi designs are great if you want the henna color to dominate your hands. 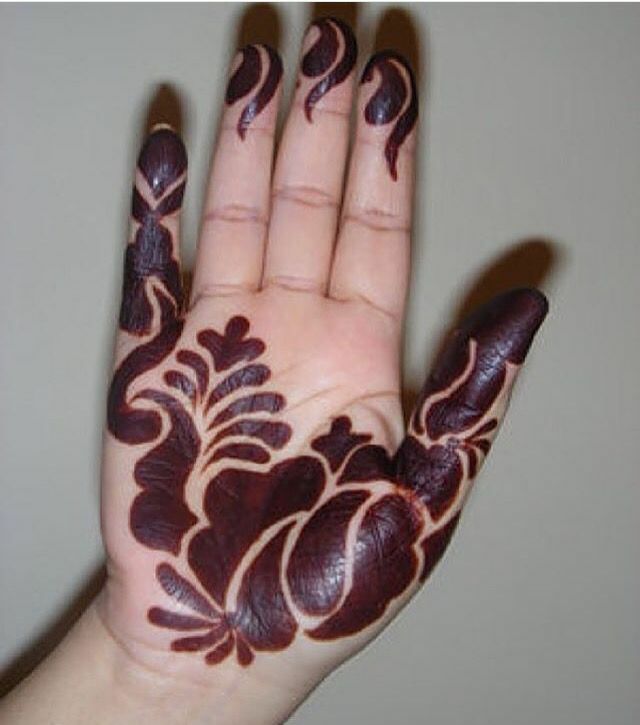 Its best to try this design on your palms as the color left by henna is darkest on the palms. 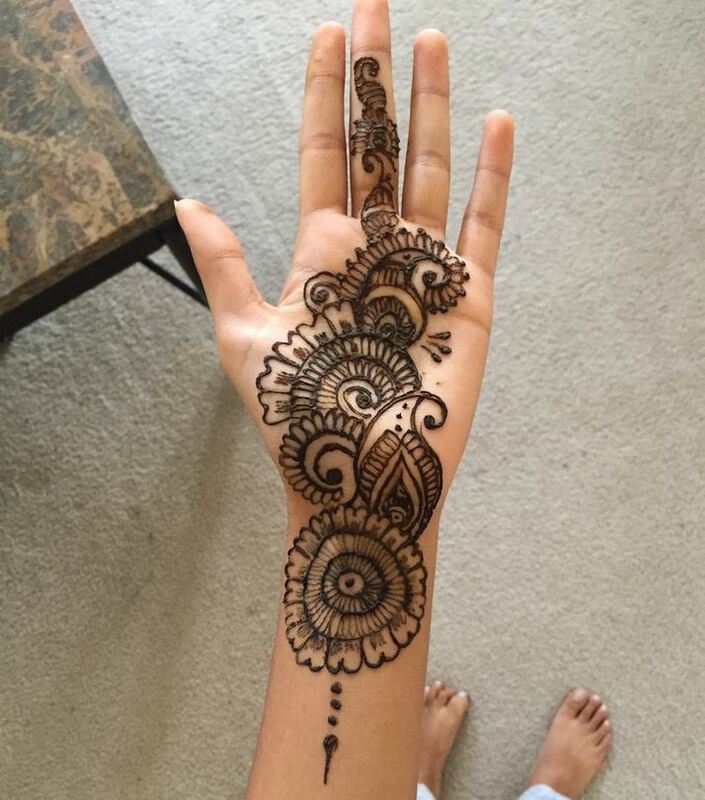 It looks bold and beautiful and can be drawn by a novice without much efforts! 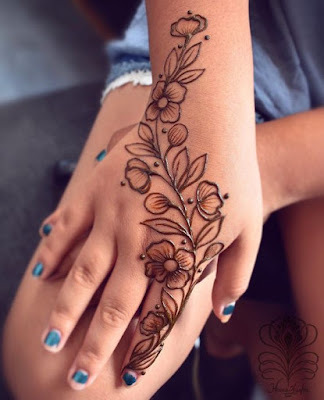 One of the easiest methods to create a mehendi pattern that is cute and stylish is to cap the tips of your fingers and draw cute little flower motifs just below them on fingers to give it an attractive look. This back mehndi design with its fish scale like pattern is unique from every angle. 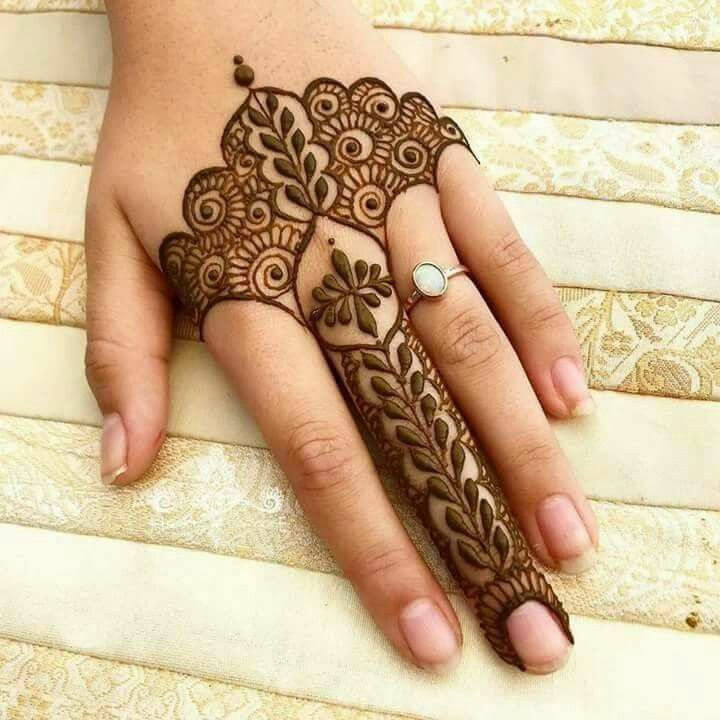 The border of this pattern is decorated with small floral motifs giving the whole design a beautiful and classic bridal glove look. This is one of our favorites for its distinctness and eye-catching idea. If you are having a anniversary celebration or any occasion that celebrates you and your partner, you can go for this name engraving mehndi pattern and get the name of your partner engraved in a heart shaped pattern like this. It would look lovely and mean a lot to your doting partner. If you are more of a simpler mehndi person you can always choose a alphabet pattern like the one below. Get the initial of your name or any other loved one engraved in a beautiful pattern on the hand to give a lovely temporary tattoo look. 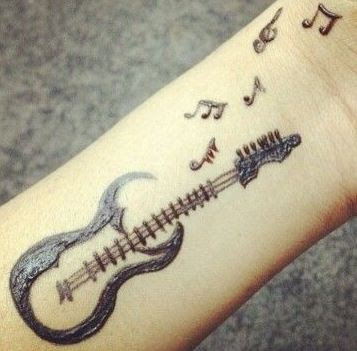 This is the most basic mehndi design one can draw. We all grew up learning to love nature and plant more trees and using this significant tree motif in your mehndi art will lighten and brighten your hands. The design is accompanied by various swirls and delicate borders. 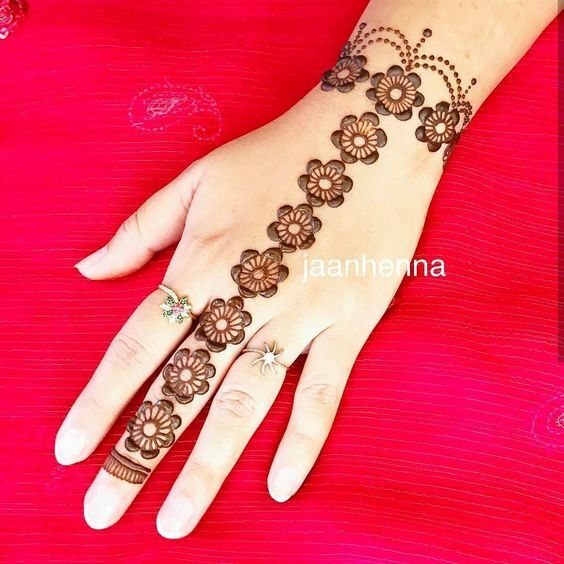 This elegant palm mehndi design with capped fingers and a single gorgeous floral motif of medium size on the bottom right and bottom left of your palms is extraordinary and wonderful ! 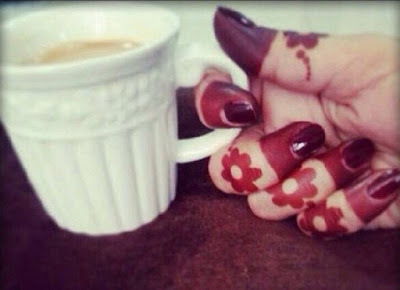 Anybody can draw this for it takes very little practice and effort to draw this pattern. Henna is not just for hands, it looks great as a delicate or a graceful tattoo on your body! Here’s one henna simple rose tattoo design that you can try. It is very feminine and also has a delicate touch to it. Check out the simple filling detailing done here in the roses. 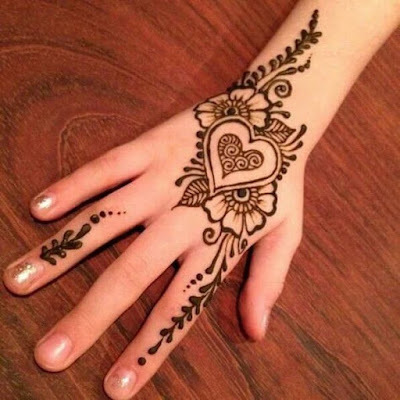 This is an absolute favorite and with February 14th just round the corner you can do this simple heart shaped henna pattern on your hand to impress your second half or the love of your life! 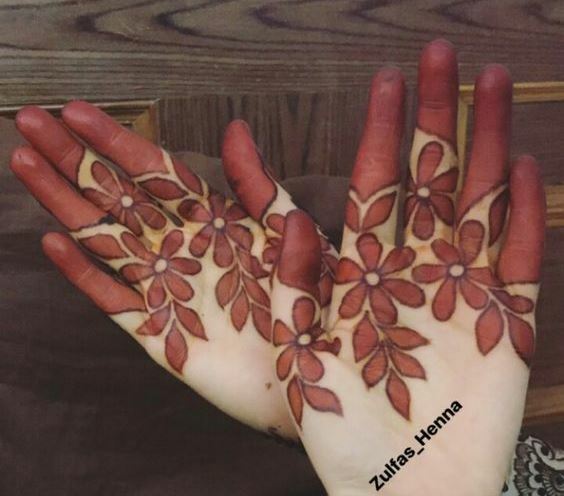 #88 Bridal Mehndi Designs 2019 : Do your own henna on your wedding day! 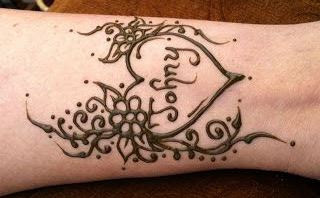 Another jewellery inspired henna design to make it big this year is this hatke heart patterned mehndi design. The notable small heart patterns used to draw the entire pattern are stunning and get a 100% when it comes to ease of drawing! A Lotus flower other than being the national flower of India ,represents grace, sensuality, purity and prosperity. 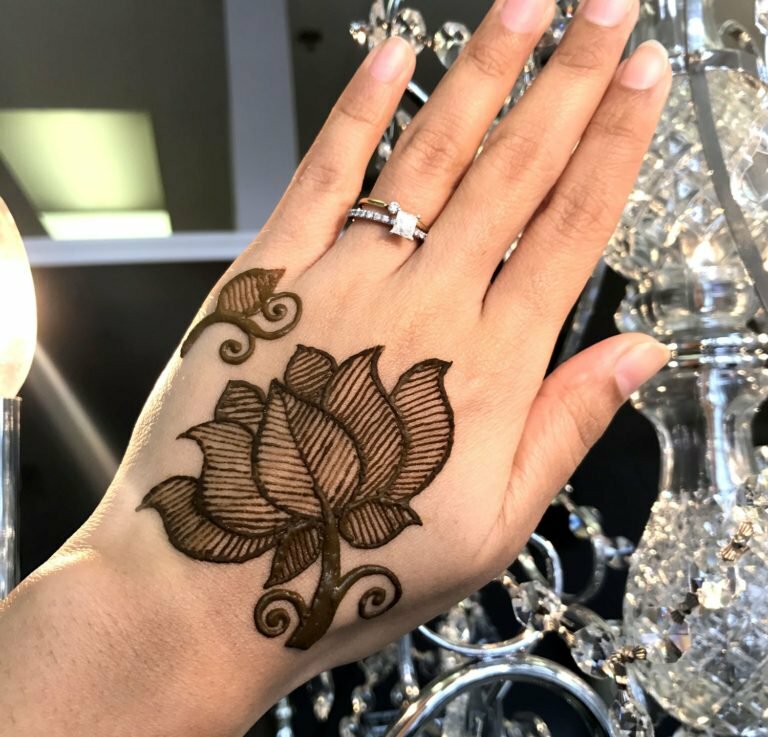 A great reason to include to a lotus pattern in your henna is that it looks very pretty when drawn as mehndi designs on hands and your feet, giving a completely new look to your mehndi applied hands ! Side mehndi patterns are all over the place and quite trending at the moment. If you are a minimalist then this design will hold great appeal to you. #118 Swirls And Tulip Mehndi Designs: Easy and amazing at the same time! A combination of large and small pretty roses makes this pretty rose mehndi design a great option for a small family function or any occasion for that matter. 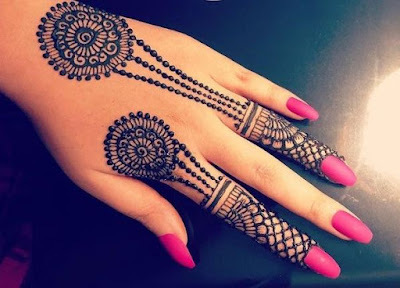 try this mehndi design the nest time you want your hands to look super pretty and chic. 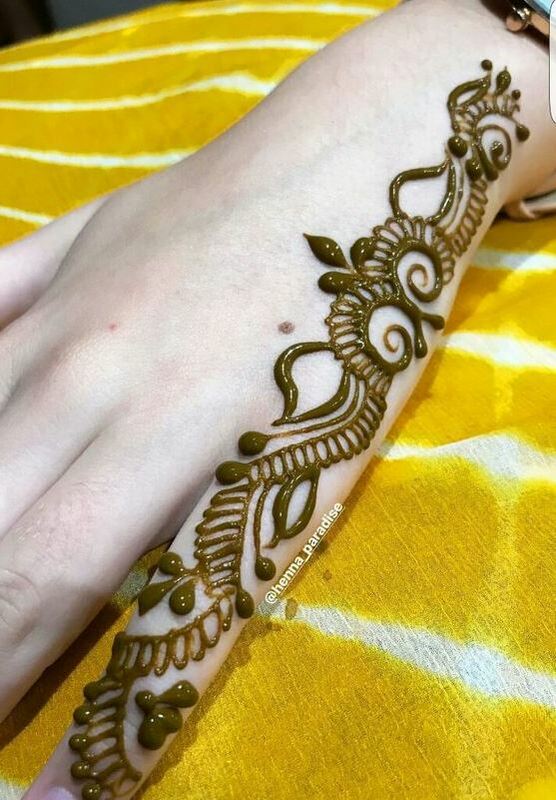 Most of the new age brides are conscious when it comes to spending tonnes of money on something you can try on your own and do not prefer spending a lot on mehndi artists .If you are one of those and would like to get a beautiful yet creative mehndi design done for your wedding , this is your mehndi design ladies ! This is very easy and can be done by almost every beginner for the bride to be! Absolutely love the overlapping criss cross patterns and leaf vines in this easy bridal mehndi design that looks like a gorgeous bridal glove after its fully applied. 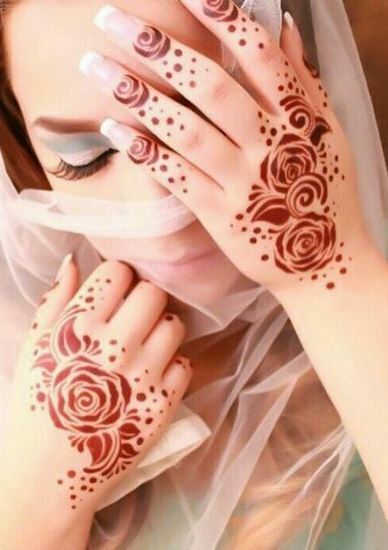 Most of these designs are Arabic design with big flowers and small roses. Lots of empty spaces and simple filler patterns for their easy to draw. It also has Indian design with a modern twist and loads of peacocks and floral motifs. 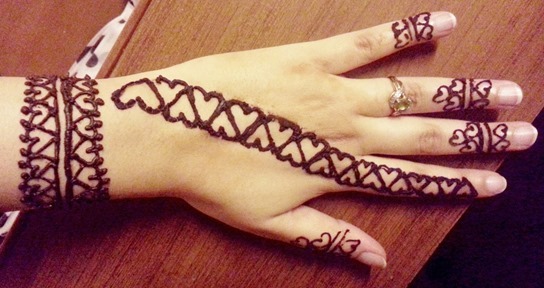 I have also thrown in a few Indo-Arabic fusion mehndi designs which have geometric triangles along with flowers. Hope you found our beginners guide to mastering easy and beautiful mehndi art helpful. Comment down as to which is your absolute favorite easy mehndi pattern and the one you are willing to begin your mehndi learning journey with! We hope you love the simple mehndi designs we have compiled for you.These were all the gorgeous easy mehndi designs you can give a try in the year 2019. Which among all these latest and creative easy mehndi designs was your favorite? Leave a comment below !